Although the earliest—rudimentary—attempts at exploiting the immune system for cancer therapy can be traced back to the late 18th Century, it was not until the past decade that cancer immunotherapeutics have truly entered mainstream clinical practice. Given their potential to stimulate both adaptive and innate antitumor immune responses, dendritic cells (DCs) have come under intense scrutiny in recent years as pharmacological tools for cancer immunotherapy. Conceptually, the clinical effectiveness of this form of active immunotherapy relies on the completion of three critical steps: 1) the DCs used as immunotherapeutic vehicles must properly activate the antitumor immune effector cells of the host, 2) these immune effector cells must be receptive to stimulation by the DCs and be competent to mediate their antitumor effects, which 3) requires overcoming the various immune-inhibitory mechanisms used by the tumor cells. In this review, following a brief overview of the pivotal milestones in the history of cancer immunotherapy, we will introduce the reader to the basic immunobiological and pharmacological principles of active cancer immunotherapy using DCs. We will then discuss how current research is trying to define the optimal parameters for each of the above steps to realize the full clinical potential of DC therapeutics. Given its high suitability for immune interventions, acute myeloid leukemia was chosen here to showcase the latest research trends driving the field of DC-based cancer immunotherapy. Although the idea of exploiting the immune system for cancer therapy has been around for more than two centuries, immunotherapy has only recently become a mainstream cancer treatment (Rosenberg, 1999). This journey culminated in immunotherapy being nominated by the journal Science as Breakthrough of the Year for 2013 (Couzin-Frankel, 2013). The timeline presented in Fig. 1 provides a nonexhaustive overview of the pivotal milestones in the history of cancer immunotherapy. The first known attempt to immunize against cancer was made in 1777 by the surgeon to the Duke of Kent, James Nooth, who injected himself with malignant tissue to prevent the development of cancer (Rosenberg, 1999; Ichim, 2005). Cancer immunotherapy formally started in 1891 (Ichim, 2005) (Fig. 1), when William Coley —regarded by many as the Father of Immunotherapy— described the regression of cancer after injection of a bacterial preparation and postulated that this was due to the induction of antitumor immunity (Coley, 1891). In 1909, Paul Ehrlich hypothesized that the immune system could protect the host against developing cancers, thereby laying the foundation for the “cancer immune surveillance” theory (Ehrlich, 1909). It took another 50 years, however, before the concept of cancer immune surveillance was developed by Lewis Thomas (Thomas, 1959) and Frank MacFarlane Burnet (Burnet, 1967). Thomas’ and Burnet’s views on the critical role of the immune system in preventing the development of cancer were supported by a series of mouse tumor transplantation experiments conducted during the mid-1940s to early-1960s (Fig. 1), which led to the hypothesis that tumor cells express specific “antigens” that permit their recognition and elimination by the immune system (Gross, 1943; Foley, 1953; Baldwin, 1955; Prehn and Main, 1957; Klein et al., 1960). In the following decades, the interactions between the immune system and cancer cells were defined, resulting in the central tenet of cancer immunotherapy: the finding that CD8+ effector T cells (also called cytotoxic T lymphocytes [CTLs]) are capable of selectively killing tumor cells after recognition of specific antigens expressed on the tumor cell surface in association with major histocompatibility complex (MHC) molecules (Zinkernagel and Doherty, 1974a,b; Coulie et al., 2014). More recently, other immune components, such as natural killer (NK) cells, have been shown to contribute to the host defense against cancer (Marcus et al., 2014). Milestones in the history of cancer immunotherapy. The timeline depicts some of the pivotal milestones in the history of cancer immunotherapy, with a particular focus on dendritic cell (DC)-based cancer immunotherapy. References: 1(Rosenberg, 1999); 2(Coley, 1891); 3(Ehrlich, 1909); 4–8(Gross, 1943; Foley, 1953; Baldwin, 1955; Prehn and Main, 1957; Klein et al., 1960); 9(Thomas et al., 1957); 10, 11(Thomas, 1959; Burnet, 1967); 12(Coulie et al., 2014); 13(Steinman and Cohn, 1973); 14, 15(Zinkernagel and Doherty, 1974a,b); 16(Kiessling et al., 1975); 17(van der Bruggen et al., 1991); 18(Hsu et al., 1996); 19(Kantoff et al., 2010); 20(Pardoll, 2012). *Allogeneic hematopoietic stem-cell transplantation, which is nowadays widely used in the treatment of hematologic malignancies including acute myeloid leukemia, is considered as a form of immunotherapy because its primary mechanism-of-action relies on the transfusion of lymphocytes endowed with antitumor activity (the so-called graft-versus-leukemia or graft-versus-tumor activity) (Topalian et al., 2011). #Ipilimumab (Yervoy; Bristol-Myers Squibb), an mAb directed against CTLA-4, was the first-in-class immune checkpoint mAb to be approved by the U.S. Food and Drug Administration (FDA) and by the European Medicines Agency for patients with metastatic melanoma (in 2011). Nivolumab (Opdivo; Bristol-Myers Squibb/Ono Pharmaceutical) and pembrolizumab (Keytruda; Merck, Kenilworth, NJ), two mAbs directed against the immune checkpoint molecule PD-1, have gained recent approval by the Japanese health authorities and the FDA, respectively, for use in patients with advanced melanoma (Galluzzi et al., 2014). Most currently available cancer immunotherapeutics aim to harness the T-cell (adaptive) immune response against cancer (Coulie et al., 2014). These can broadly be divided into passive and active therapies (Mellman et al., 2011; Topalian et al., 2011). Passive immunotherapies have been in clinical practice for some time in the form of T-cell immunomodulatory monoclonal antibodies (mAbs) and adoptive cell transfer (ACT) (Mellman et al., 2011). Ipilimumab (Yervoy; Bristol-Myers Squibb, New Brunswick, NJ) is the prototype of the rapidly growing family of T-cell–potentiating mAbs. It targets cytotoxic T-lymphocyte antigen‐4 (CTLA-4), which serves as an immune checkpoint molecule on T cells (i.e., a molecule involved in the negative regulation of T-cell function) (Hodi et al., 2010; Pardoll, 2012). ACT involves the transfusion of allogeneic or autologous tumor-reactive T cells (and/or other antitumor immune effector cells) (June, 2007). The past decade has witnessed several major advancements in the field of ACT, including the use of T cells genetically engineered to express T-cell receptors (TCRs) or chimeric antigen receptors to enable targeting of predefined, clinically relevant tumor antigens (Park et al., 2011; Restifo et al., 2012). For detailed information on mAb-mediated immune checkpoint blockade and ACT, we refer the reader to other overview articles on these topics (Pardoll, 2012; Kershaw et al., 2013). This review will focus on active immunotherapy using tumor antigen–loaded dendritic cells (DCs) for anticancer “vaccination.” Although it is increasingly evident that at least part of its pharmacological mechanism-of-action relies on activation of innate antitumor effectors (in particular NK cells) (Lion et al., 2012a; Van Elssen et al., 2014; Van Acker et al., 2015), the basic concept behind DC therapy is to exploit the intrinsic antigen-presenting properties of DCs to elicit a potent tumor antigen-specific T-cell–driven immune response (Anguille et al., 2014; Datta et al., 2014). In contrast to the two aforementioned passive cancer immunotherapy strategies, DC therapy aspires to “train” the host’s immune system to recognize and attack cancer cells and, in so doing, enable the generation of immunologic memory (Rescigno et al., 2007; Melero et al., 2014). As shown in the timeline, the DC story began more than four decades ago in 1973 (Fig. 1). In that year, Zanvil Cohn and Ralph Steinman (who was awarded the 2011 Nobel Prize in Medicine and Physiology for his seminal work on DCs) described a rare population of mouse splenocytes with a distinctive tree-like morphology (Steinman and Cohn, 1973). The cells were therefore named dendritic cells, after the Greek word for tree (dendreon) (Steinman, 2007). Interest in the therapeutic exploitation of DCs grew after it became apparent that DCs, in their role as highly specialized antigen-presenting cells (APCs), are instrumental in the development of adaptive antitumor immunity (Palucka and Banchereau, 2012; Mellman, 2013). The first clinical trial of DC-based vaccine therapy was published in 1996 (Hsu et al., 1996) (Fig. 1). Since then, numerous clinical studies have been conducted across a wide range of cancer types, including phase III clinical trials in melanoma, prostate cancer, glioblastoma, and renal cell carcinoma (Anguille et al., 2014). These studies provided ample evidence that DC therapy is safe and capable of mounting protective antitumor immunity without major toxicity (Anguille et al., 2014). Until recently, the clinical benefit of DC-based cancer immunotherapy was deemed modest. However, this field was reinvigorated after the demonstration of survival gains in DC-treated cancer patients in a number of trials (Anguille et al., 2014; Cao et al., 2014; Wang et al., 2014). The foremost example is sipuleucel-T (Provenge; Dendreon Corporation, Seattle, WA), the first and currently the only DC-based immunotherapeutic that received approval from the U.S. Food and Drug Administration. Despite limited therapeutic benefit based on the assessment of the prostate-specific antigen tumor marker response, sipuleucel-T was found to improve overall survival by 4.1 months compared with placebo (25.8 versus 21.7 months) in a phase III clinical trial for metastatic hormone-refractory prostate cancer (Kantoff et al., 2010). The field of DC-based cancer immunotherapy continues to evolve rapidly (Anguille et al., 2014). Current research efforts are driven by a constant desire to optimize this form of immunotherapy and to increase its antitumor activity (Datta et al., 2014). There are now a diverse range of DC vaccine products with improved therapeutic activity (Anguille et al., 2014). The ever-expanding portfolio of immune checkpoint mAbs and other cancer (immunotherapy) drugs has set the stage for combination therapies, which will likely further improve the efficacy of DC-based cancer immunization (Anguille et al., 2014). Following a brief introduction into the basics of the biology of DCs (section II.A) and the various DC vaccine formulations currently used for immunotherapy (section II.B), we will review the different avenues that are currently being pursued to maximize the immunologic potency and therapeutic activity of this exciting and promising immunotherapeutic modality (section III). Dendritic cells are a rare population of APCs that originate from hematopoietic progenitor cells in the bone marrow (Collin et al., 2013). They are specialized in antigen uptake, processing, and presentation to T cells (MacDonald et al., 2002). DCs can be found throughout the body, in particular at sites of potential antigenic encounter (e.g., the skin) (Benteyn et al., 2015). The taxonomy of the DC system is complex and will be only briefly discussed here. The reader is directed to MacDonald et al. (2002), Ziegler-Heitbrock et al. (2010), Collin et al. (2013), Merad et al. (2013), Cohn and Delamarre (2014), and Mody et al. (2015), for a comprehensive review of the DC nomenclature. The human DC family consists of several distinct subsets, which differ from each other with respect to their localization, cell-surface phenotype, and functional specialization (Collin et al., 2013). For example, the human skin hosts two main types of DCs: epidermal Langerhans cells (LCs) and dermal DCs (Mody et al., 2015). Langerhans cells are characterized by expression of the cell-surface markers CD1a and CD207/Langerin and are functionally endowed with a potent CTL-stimulatory activity, especially when compared with CD14+ dermal DCs (Ueno et al., 2010; Banchereau et al., 2012). Blood DCs, which constitute less than 1% of the total peripheral blood mononuclear cell (PBMC) fraction (Jongbloed et al., 2010), are usually divided into two main subsets based on their hematopoietic cell-lineage origin (MacDonald et al., 2002): myeloid DCs (mDCs; also termed conventional DCs; myeloid lineage) and plasmacytoid DCs (pDCs; lymphoid lineage). The myeloid DC population is characterized by the phenotypic expression of CD11c and contains two distinct subsets (MacDonald et al., 2002; Collin et al., 2013): CD1c/BDCA-1+ mDCs and CD141/BDCA-3+ mDCs. Plasmacytoid DCs can be phenotypically discriminated from mDCs based on the lack of CD11c expression and based on their positivity for CD123, CD303/BDCA-2, and CD304/BDCA-4 (MacDonald et al., 2002; Collin et al., 2013). The functional differences between these individual DC subsets, in particular the subroles they play in antitumor immunity, remain to be fully elucidated. CD141+ mDCs have been postulated to be superior over other DCs subsets at (tumor) antigen cross-presentation (Jongbloed et al., 2010) [i.e., the ability of APCs to present exogenous antigens—which are normally directed into the MHC class II pathway—via MHC class I molecules to CD8+ T cells (Nierkens et al., 2013; Cohn and Delamarre, 2014)], although more recent studies have shown that all blood DC subsets have fairly similar cross-presentation capacities (Cohn et al., 2013; Segura et al., 2013; Tel et al., 2013b). Dendritic cells can also be subdivided into two main types based on their developmental stage: immature DCs and mature DCs (Datta et al., 2014; Benteyn et al., 2015). Immature DCs continuously sample the peripheral tissues for foreign antigens. They are highly specialized in uptake of these antigens and are equipped with a wide range of phagocytic and endocytic receptors (e.g., C-type lectins, such as the mannose receptor) to fulfill this function (Sallusto et al., 1995). Immature DCs have rather low expression of MHC and T-cell costimulatory molecules on their cell surface and a limited capacity for secreting proinflammatory cytokines (Benteyn et al., 2015). As a result, they are largely ineffective at stimulating T-cell responses (Benteyn et al., 2015). Moreover, immature DCs can lead to T-cell tolerance by inducing T-cell deletion/anergy and by promoting the generation of T cells with intrinsic immunosuppressive properties [also called regulatory T (Treg) cells] (Mahnke et al., 2002). When antigen uptake occurs in the presence of inflammatory cytokines or danger signals (such as those provided by infectious organisms or dying cancer cells), immature DCs will undergo a maturation process that is characterized by decreased capacity for antigen uptake, increased expression of MHC and T-cell costimulatory molecules (such as CD40, CD70, CD80, and CD86), and enhanced production of proinflammatory cytokines and chemokines (Benteyn et al., 2015). DCs express different families of pattern recognition receptors that enable them to sense such danger signals; among these, the family of the so-called Toll-like receptors (TLRs) is perhaps the best characterized (Medzhitov, 2001). As will be discussed later in this review, TLR ligands are being increasingly adopted in DC vaccine manufacturing protocols to stimulate DC maturation. Examples are polyinosinic:polycytidylic acid [poly(I:C), a TLR3 agonist] (Ammi et al., 2015), picibanil (OK-432, a TLR4 agonist) (Kitawaki et al., 2011a), and resiquimod (R-848, a dual TLR7/8 agonist) (Smits et al., 2008). The conversion of immature DCs into mature DCs is also accompanied by an upregulation of chemokine receptors, such as the C:C chemokine receptor type-7 (Sallusto et al., 1998). This enables the DCs to migrate via the afferent lymphatics to the T-cell–rich areas of the lymph nodes (De Vries et al., 2003; Wimmers et al., 2014) (see Supplemental Video for an animation illustrating the process of DC migration to the lymph nodes). The clinical success of DC-based therapies against AML and, by extension, other cancer types relies on three key conditions. Improvements in the therapeutic efficacy of DC vaccine strategies against AML will require 1) a further enhancement of the immunogenicity of the DC products to ensure optimal stimulation of the immune effector cells (such as T and NK cells); 2) augmenting the strength of the antileukemic immune response, e.g., by overcoming Treg-mediated immunosuppression; and 3) increasing the responsiveness of AML cells to immune attack by making these cells visible to the immune system and by overcoming their immune escape mechanisms. The figure inset shows a close-up of the immunological synapse between DCs and T cells. The outcome of DC–T-cell interaction, i.e., T-cell activation or inhibition, is determined by the balance between various positive (+) and negative (−) signals delivered via distinct cell surface receptors and their ligands, cytokines (e.g., IL-10 and IL-12) and enzymes (e.g., IDO). Targeting immune checkpoints, such as CTLA-4, PD-1 or its ligands, and BTLA, can help to tip the balance in favor of protective anti-tumor immunity. HVEM, herpes virus entry mediator; TNF(R)SF, TNF (receptor) super family; SOCS-1, suppressor of cytokine signaling-1. Signal 1: Presentation of the antigen in the context of MHC molecules to a compatible TCR. Antigenic peptides bound to MHC class II molecules are presented to CD4+ T cells [which can differentiate into T helper type 1 (TH1), type 2 (TH2), or type 17 (TH17) subsets] (Datta et al., 2014), whereas those bound to MHC class I molecules are recognized by CD8+ CTLs (Cohn and Delamarre, 2014) (Supplemental Video). Signal 2: Delivery of appropriate costimulatory signaling. The outcome of this process is determined by the balance between the different activating (positive) and inhibiting (negative) signals that the T cells receive from the DCs (Vasaturo et al., 2013). These signals are delivered through interaction of costimulatory and coinhibitory molecules expressed on the DC surface with their respective counter-receptors on the T cells (Vasaturo et al., 2013) (Supplemental Video). As shown in Fig. 2, multiple costimulatory and coinhibitory receptor/ligand pairs have been identified. Most of these molecules are either immunoglobulin superfamily members or tumor necrosis factor (TNF) and TNF receptor superfamily members (Murphy et al., 2006). CD80, CD86, and programmed death-ligand 1 or 2 (PD-L1/2) are examples of immunoglobulin superfamily members expressed on the DC surface, whereas CD28, CTLA-4, programmed death (PD)-1, and B and T lymphocyte attenuator (BTLA) belong to the same family but are expressed on the T cells (Greaves and Gribben, 2013). CD40, CD70, OX40L, 4-1BBL, and herpes virus entry mediator, which are expressed on the DC surface, and CD40L, CD27, OX40, and 4-1BB, which are expressed on the T cells, are all examples of TNF (receptor) superfamily members (Vinay and Kwon, 2009) (Fig. 2, inset). Signal 3: Production of T-cell–stimulatory cytokines. The third signal or “polarization” signal, involves the secretion of proinflammatory cytokines by DCs, including interferons (IFNs) and interleukin-12 (IL-12) (Kalinski and Okada, 2010; Vasaturo et al., 2013). These cytokines stimulate the expansion, effector function, and memory development of CTLs (Curtsinger and Mescher, 2010). IL-12, which can be produced after interaction of CD40 with CD40L, also plays a decisive role in determining the type of CD4+ T-cell immunity (Kalinski and Okada, 2010); it polarizes the differentiation of naive CD4+ T cells into TH1 cells, which in turn provide “help” to the CTLs (Kalinski and Okada, 2010; Wimmers et al., 2014). Recently, the addition of a fourth signal to the above “three-signal theory” has been proposed. This signal covers all DC-related factors that enable the activated CTLs to home to the tumor site (Kalinski and Okada, 2010). Once arrived at the tumor site, these CTLs will look for tumor cells that express their cognate antigen in the form of peptide fragments bound to MHC class I molecules (Anguille et al., 2013). After interaction of the MHC/antigen complex with the TCR, CTLs will be triggered to release cytotoxic effector molecules (such as perforins and granzymes), resulting in lysis of the recognized tumor cells (Trapani and Smyth, 2002; Anguille et al., 2013). Over the past few decades, a great deal of research has been committed to translating the above immunobiological principles into clinically applicable pharmaceutical approaches. From the pharmacological point of view, DC-based immunotherapy is regarded as a vaccination strategy whereby tumor antigen-loaded DCs are administered to the patient with the intent of eliciting protective and specific CTL immunity toward the tumor cells (Cohn and Delamarre, 2014). From the regulatory point of view, DC vaccines are classified as “human cell, tissue, or cellular or tissue-based products” (U.S. Food and Drug Administration terminology) or as “advanced therapy medicinal products” (European Medicines Agency terminology), which are a special group of therapeutics including gene therapies, tissue-engineered products, and somatic cell therapies (Maciulaitis et al., 2012). Sipuleucel-T is the first, and so far only, DC-based advanced therapy medicinal product that received regulatory approval for the treatment of metastatic, hormone-refractory prostate cancer (Melero et al., 2014). The manufacturing of this autologous blood cell product starts with a so-called leukapheresis procedure to obtain large numbers of autologous PBMCs. These PBMCs, which contain APCs including, but not restricted to, DCs, are then cultured ex vivo for 36–44 hours in the presence of PA2024, a recombinant fusion protein consisting of the tumor antigen prostatic acid phosphatase and the immunostimulatory cytokine granulocyte-macrophage colony-stimulating factor (GM-CSF). After this simultaneous antigen loading and activation step, the cells are washed and suspended for intravenous reinfusion into the patient (Kantoff et al., 2010). In addition to this transfusion-like protocol, DCs can also be isolated directly from the blood and used for immunotherapeutic purposes (Bol et al., 2013; Wimmers et al., 2014). The use of native blood DCs has, however, been hampered by the relatively low frequency of DCs in peripheral blood (as discussed earlier in this section, DCs represent only 1% of the total PBMC fraction) (Bol et al., 2013; Wimmers et al., 2014). Hence, only few studies exist that have attempted the clinical translation of this strategy. One example involves the collection of large numbers of PBMCs (through leukapheresis) and subsequent isolation of blood DCs using a mAb against CMRF-56, an antigen that is expressed on the DC surface after a short overnight in vitro incubation (Lopez et al., 2003; Radford et al., 2005). The CMRF-56 isolation platform can be used to obtain a blood DC-enriched PBMC fraction that contains roughly one-third of DCs including both CD1c+ and CD141+ mDC subsets as well as pDCs (Vari et al., 2008). Directly isolated, highly purified native blood CD1c+ DCs (Schreibelt et al., 2014) as well as pDCs (Tel et al., 2013a) have been used to vaccinate melanoma patients. Just recently, a similar strategy was adopted by Prue et al. (2015) using CD1c+ mDCs directly isolated by immunomagnetic selection from leukapheresis products of prostate cancer patients. Despite the overall limited experience, these studies confirm the technical feasibility of using naturally circulating DCs as vaccine vehicles for cancer immunotherapy (Wimmers et al., 2014). Nevertheless, rather than using primary DCs, most clinical experience so far has been obtained with DCs cultured ex vivo starting from precursor cells that are available in much greater quantities than naturally circulating blood DCs (Anguille et al., 2012c). Cell types frequently used as starting material for DC vaccine manufacturing are monocytes (Anguille et al., 2012c) and CD34+ hematopoietic progenitor cells derived from bone marrow (Lardon et al., 1997), peripheral blood (Mu et al., 2004), or cord blood (Chen et al., 2013). Monocyte-derived DCs (moDCs) are by far the most commonly used DC type in DC vaccine formulations (Anguille et al., 2014; Chiang et al., 2015). This type of DC vaccine is usually produced by isolating CD14+ monocytes from leukapheresis products and by culturing them in vitro for 5–6 days into immature DCs with GM-CSF and IL-4 (Tacken et al., 2007) (Fig. 3; Supplemental Video). Because immature DCs are considered to be poor stimulators of immunity, the next step in DC vaccine manufacturing is to trigger their activation/maturation by exposing the immature DCs for another 2 days to a proinflammatory cytokine cocktail composed of TNF-α, IL-1β, IL-6, and prostaglandin E2 (PGE2), commonly referred to as the “Jonuleit” cytokine cocktail (Jonuleit et al., 1997) (Fig. 3). To complete the DC vaccine production process, DCs must be loaded with disease-relevant tumor antigen(s), a step that can be performed either at the immature or at the mature stage (Tacken et al., 2007) (Fig. 3). Although being considered as the “gold-standard” DCs, these so-called IL-4 moDCs might be suboptimal for inducing TH1-mediated anticancer T-cell immunity because they resemble in vivo occurring CD14+ dermal DCs known to stimulate humoral immunity (Palucka et al., 2010; Palucka and Banchereau, 2012). As discussed above, LCs, presumably via a mechanism that involves IL-15, are far more superior than dermal DCs (Banchereau et al., 2012) and moDCs (Romano et al., 2012; Hutten et al., 2014) in terms of their capacity to stimulate antigen-specific CTL immunity. This explains the impetus behind the recent efforts to design new protocols for the generation of DCs with LC-like features (Hutten et al., 2014). Such LC-type, IL-15–expressing DCs can be generated from CD34+ hematopoietic progenitor cells using specific differentiation factors (Romano et al., 2011) or from CD14+ monocytes by replacing IL-4 with IL-15 (Mohamadzadeh et al., 2001; Anguille et al., 2009, 2013). The gold-standard protocol for DC vaccine manufacturing. DC-based immunotherapeutics are classically prepared using an in vitro culture procedure, in which 1) peripheral blood monocytes are allowed to differentiate into immature DCs in the presence of GM-CSF and IL-4 for 5–6 days and then 2) exposed for another 2 days to a proinflammatory cytokine cocktail to induce DC maturation. Before administration to the patient, DCs are first loaded with tumor antigen “cargo”; this antigen-loading step can be performed either at the immature or mature DC stage. Each of these phases in the DC manufacturing process can have a major impact on the immunostimulatory potency of the final DC product. Therefore, much ongoing research is devoted to modifying and optimizing the culture conditions for DC generation to ensure that DCs with the “best possible” immunostimulatory capacities are being used for immunotherapy and, ultimately, to maximize the chances of therapeutic success. Examples of such modifications are listed in the text box insets. As may be clear from the previous section on the immunobiology of DCs, the immunogenicity of DC vaccines will not only depend on the type of DC used in the vaccine formulation, but also on the functional state of the DCs induced by maturation signals (Kirkwood et al., 2012; Datta et al., 2014). The conventional Jonuleit cytokine cocktail implemented in most DC vaccine production protocols has several important limitations, which will be discussed in detail in the next section. Hence, there is currently a great deal of research into developing alternative DC maturation procedures (Butterfield, 2013; Anguille et al., 2014). Within this context, TLR agonists have come under intense scrutiny given their ability to endow DCs with potent TH1-polarizing capacity, which is the type of immune response that is most desired in cancer immunotherapy (Kirkwood et al., 2012). Such TLR stimuli can either be administered concomitantly with the DC vaccine or can be incorporated into the vaccine itself, for example as ex vivo maturation agents (Anguille et al., 2014). Various clinical-grade TLR-based protocols for maturing DCs have been published in recent years, but, for the sake of brevity, only two will be discussed here: α-type-1–polarized DCs and TriMix DCs. α-Type-1–polarized DCs, which derive their name from the fact that they are highly specialized at inducing TH1 immune responses (Kirkwood et al., 2012), are generated by exposing immature DCs to a combination of TNF-α, IL-1β, IFN-γ, IFN-α, and the TLR3 agonist poly(I:C) (Okada et al., 2011; Hansen et al., 2013). Okada et al. (2011) recently reported on the results of a clinical trial of α-type-1–polarized DC vaccinations with concurrent systemic administration of a TLR3 agonist in patients with recurrent malignant glioma. Although single arm and early phase, the study by Okada et al. (2011) hinted at a possible clinical benefit and provided the impetus for other, currently ongoing clinical trials investigating the clinical efficacy of this particular DC vaccine formulation (Kirkwood et al., 2012; Anguille et al., 2014). Instead of exogenous pulsing with maturation-inducing cytokines, DCs with an activated/mature phenotype can also be obtained using genetic engineering techniques such as mRNA electroporation (Benteyn et al., 2015). Thielemans’ group at the Free University of Brussels (Brussels, Belgium) has pioneered a method to generate clinical-grade, mature DCs by electroporating immature DCs ex vivo with a mixture of three mRNA molecules (TriMix) coding for a constitutively active TLR4, CD40L, and CD70, respectively (Benteyn et al., 2015). These so-called TriMix DCs have been used with promising results to vaccinate melanoma patients (Van Lint et al., 2014). Another pharmacological aspect that deserves to be mentioned here relates to the route of administration of DC vaccines. To encounter T cells and induce tumor antigen-specific T-cell immunity, DCs must be recruited to the lymph nodes (Verdijk et al., 2008). DCs that are injected intravenously are believed to be ineffective because they localize in lungs, liver, spleen, and bone marrow, rather than in the lymph nodes (Fong et al., 2001; Mullins et al., 2003). Nevertheless, in a recently published clinical trial (Wilgenhof et al., 2013), signs of clinical benefit have been obtained after intravenous TriMix DC vaccination, corroborating earlier studies that already indicated that DCs can induce immunity even when administered via the intravenous route (Fong et al., 2001; Bedrosian et al., 2003). Most often, DC vaccines are delivered by intradermal injection nearby superficial lymph nodes (Wimmers et al., 2014). After injection into the skin, DCs will use their chemokine receptors (e.g., C:C chemokine receptor type-7) to migrate from the skin via the afferent lymphatics to the draining lymph nodes (Wimmers et al., 2014) (Supplemental Video). Importantly, however, trafficking studies revealed that most of the intradermally injected DCs die at the injection site and that only a minority (less than 5%) effectively reach the lymph nodes (Verdijk et al., 2009). To obtain higher numbers of DCs in the lymph nodes, intranodal vaccination has been tested, but its superiority over the intradermal administration route has not been unequivocally established (Bedrosian et al., 2003; Lesterhuis et al., 2011). Variable results of intranodal injection might be related to the complexity of the procedure, so that even when performed with ultrasound guidance by a highly experienced radiologist, a high portion of the injections will not or only partly be delivered intranodally (de Vries et al., 2005; Verdijk et al., 2009; Lesterhuis et al., 2011). In addition to the administration route, the optimal dose of DC vaccination is another pharmacological variable that still remains to be fully established despite the numerous phase I clinical trials that have already been performed (Figdor et al., 2004; Butterfield, 2013). Many of these trials did not show any evidence of dose-limiting toxicity (Draube et al., 2011; Butterfield, 2013). Maximum tolerated doses are generally not reached in DC vaccine studies, and the highest achievable dose levels are usually defined by the total number of DCs that can be produced from one leukapheresis (i.e., the maximum feasible dose) (Butterfield, 2013; Tel et al., 2013a). A meta-analysis of 29 DC vaccine trials in prostate cancer and renal cell cancer, including a total of 906 patients, revealed a positive association between total DC dose and clinical outcome, indicating that appropriate dosage is critical for therapeutic success (Draube et al., 2011). Unfortunately, this meta-analysis does not permit to draw firm conclusions regarding the minimum effective dose required per vaccination. Despite the general belief that high numbers of DCs are required to stimulate a potent antitumor immune response in vivo, the above-mentioned study by Tel et al. (2013a) using naturally circulating pDCs revealed that clinical responses can be obtained even with relatively small numbers of DCs (0.3–3 × 106 DCs per vaccine). Extra evidence that higher DC numbers do not necessarily result in higher benefit was provided by Aarntzen et al. (2013), who observed a paradoxical increase in DCs reaching the lymph nodes if the number of intradermally injected DCs was reduced. Imaging data from the same group also revealed that antitumor T-cell responses can be induced with as few as 5 × 105 DCs in the T-cell areas of the draining lymph nodes (Verdijk et al., 2009). In line with this, using a computational model, Celli et al. (2012) estimated that less than 100 antigen-bearing DCs are sufficient to initiate a T-cell response in the lymph node. Overall, these data indicate that DC vaccines may be effective even at very low doses. New routes of DC-based cancer therapy are currently being explored, including in vivo targeting of DCs (Caminschi et al., 2012; Datta et al., 2014) and the use of artificial APCs (Eggermont et al., 2014). These topics have been excellently reviewed by others (Caminschi et al., 2012; Eggermont et al., 2014; Mody et al., 2015) and will not be covered in this review. The DCs used for therapy must be immunostimulatory and induce the right type of immune response (Anguille et al., 2014). The antitumor immune effector cells of the host, most notably CTLs and NK cells, must be capable of mounting protective immunity (Lizee et al., 2013). The tumor cells must be susceptible to immune attack, which requires overcoming the tumor immune escape mechanisms (Kirkwood et al., 2012). Hence, the key to unlocking the full clinical potential of DC-based cancer immunotherapeutics is to establish how these three conditions can be optimally fulfilled. In this section, we will provide an overview of the research efforts that are currently being undertaken to enable successful completion of each of these three steps. The focus here lies on the optimization of DC-based immunotherapy for AML, which, for the reasons specified in Table 1, is a particularly useful tumor type to evaluate the clinical efficacy of DC-based immunotherapy. Although AML was chosen to showcase how the DC immunotherapy field is evolving, many of the strategies that will be discussed here are broadly applicable and are currently under active investigation in other tumor types as well. The efficacy of any DC-based therapeutic strategy depends, in the first place, on the immunostimulatory quality of the DCs used (Anguille et al., 2014) (Fig. 2). As discussed earlier, the DC family is very heterogeneous, consisting of different DC subsets capable of eliciting different types of immunity. Hence, selecting the “right” DC subset for immunotherapy is of paramount importance (Gilboa, 2007; Anguille et al., 2009; Frankenberger and Schendel, 2012; Kirkwood et al., 2012; Chiang et al., 2015). Much ongoing research is concentrated on optimizing the DC product design to ensure that DCs with the best possible immunogenic characteristics are being used (Anguille et al., 2014; Datta et al., 2014; Chiang et al., 2015). There are several aspects of the DC manufacturing process that determine the immunogenicity of the final DC therapeutic product, each of which is being evaluated for possible improvements (Fig. 3) (Figdor et al., 2004; Gilboa, 2007; Tacken et al., 2007; Anguille et al., 2009; Tesfatsion, 2014). 1. Source of DC Precursor Cell. The first aspect relates to the choice of precursor cell for ex vivo DC preparation. As discussed above, most clinical trials performed hitherto have relied on monocytes as precursor cells for DC vaccine manufacturing (Supplemental Video) (Gilboa, 2007; Tacken et al., 2007; Chiang et al., 2015). Monocytes can be isolated from leukapheresis harvests by various techniques, including centrifugal elutriation, adherence, or immunomagnetic selection using anti-CD14 mAb-coated magnetic beads (Table 2) (Nicolette et al., 2007). Given the fact that moDCs are by far the most frequently used DC type in clinical trials, we will only address here the current strategies for optimizing moDC culture protocols (Fig. 3). Table 2 provides a compilation of the clinical trials of moDC-based vaccination in AML. For each clinical trial listed, details on the logistical aspects related to moDC vaccine manufacturing and a summary of the key clinical findings are provided (Table 2). Case reports are excluded from this overview. 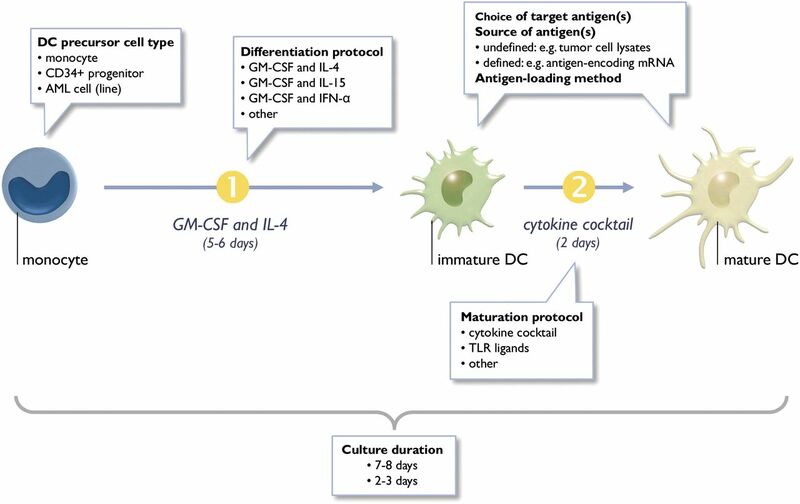 The gold-standard protocol for moDC generation encompasses 1 week of culture, including ∼5 days for differentiation of monocytes into immature DCs and ∼2 days for converting these immature DCs into mature DCs (Fig. 3; Supplemental Video) (Caux et al., 1992; Anguille et al., 2009). A number of reports have demonstrated the feasibility of reducing the total time of in vitro moDC culture from 7 to ∼3 days without affecting the phenotype or function of the resultant DCs (Czerniecki et al., 1997, 2001; Dauer et al., 2003; Anguille et al., 2009; Beck et al., 2011; Chiang et al., 2011). Moreover, these so-called Fast DCs have been shown to possess a better costimulatory phenotype than their 7-day counterparts (Lichtenegger et al., 2012) and have a lower expression of the T-cell coinhibitory molecule PD-L1 (Frankenberger and Schendel, 2012). In addition, the use of Fast DCs offers the advantage of reducing the time-consuming process of ex vivo DC manufacturing (Anguille et al., 2009). As a consequence, Fast DCs are increasingly finding their way into clinical trials, a trend that is also observed in the field of DC therapy for AML (Subklewe et al., 2014) (Table 2). The type of medium used for ex vivo DC culture is an often overlooked parameter that may influence the functional capacity of the cultured DCs (da Silva Simoneti et al., 2014). All aspects of the DC vaccine manufacturing process, including the culture media and reagents used, must comply to good manufacturing practice requirements that are enforced by health regulatory agencies to ensure the quality and safety of the DC product (Figdor et al., 2004). Different good manufacturing practice-grade DC culture media have been marketed, each yielding DCs with different immune-stimulatory properties (da Silva Simoneti et al., 2014), indicating that the choice of cell culture medium determines the potency of the final DC vaccine product. Serum, which is often added to the culture medium, is postulated to have a negative influence on DC vaccine functionality in vitro (da Silva Simoneti et al., 2014; Kolanowski et al., 2014), but the in vivo impact of using serum remains to be studied. As discussed earlier, the most commonly used cytokines for inducing moDC differentiation are GM-CSF and IL-4 (Gilboa, 2007; Anguille et al., 2009) (Fig. 3). The choice of DC differentiation regimen is an important determinant of the immunogenic quality of moDCs (Ueno et al., 2010). This is supported by the observation that the ability of moDCs to stimulate antitumor immunity can be dramatically improved by replacing IL-4 with IL-15 (Dubsky et al., 2007; Anguille et al., 2009, 2012a) or IFN-α (Papewalis et al., 2008). Such alternatively differentiated DCs can also exert direct cytotoxicity toward AML cells (Papewalis et al., 2008; Anguille et al., 2012a), further increasing their attractiveness for clinical exploitation (Roothans et al., 2013; Tel et al., 2014). The second step in moDC manufacturing involves the induction of DC maturation, a step that is usually performed by exogenous administration of a cytokine cocktail composed of TNF-α, IL-1β, IL-6, and PGE2 (Jonuleit et al., 1997; Gilboa, 2007) (Fig. 3; Supplemental Video). The major limitation to using this particular mixture is the inability of the resultant DCs to produce IL-12p70 (Kalinski et al., 2001). The lack of IL-12 secretion can mainly be attributed to the presence of PGE2 (Kalinski et al., 2001). In addition, PGE2 can induce indoleamine 2,3-dioxygenase (IDO) expression in moDCs (Braun et al., 2005), which promotes the activation of Treg cells (Chung et al., 2009) (Fig. 2, inset) and can prevent DCs from attracting naive T cells (Muthuswamy et al., 2010). However, because PGE2 is considered mandatory for licensing DCs to migrate to the lymph nodes, it cannot simply be omitted from the maturation regimen (Scandella et al., 2002). The incorporation of TLR agonists into the DC maturation cocktail may help to circumvent this problem. TLR-matured DCs have been shown to combine migratory capacity with high IL-12 production, even with PGE2 in the maturation cocktail (Boullart et al., 2008; Anguille et al., 2009; Beck et al., 2011). In addition, TLR maturation stimuli also enable DCs to overcome Treg-mediated immunosuppression (Pasare and Medzhitov, 2003; Lichtenegger et al., 2012) and to activate innate antitumor effectors, in particular NK cells (Beck et al., 2011; Lichtenegger et al., 2012). It is therefore not surprising to witness an increased use of TLR-based maturation regimens in clinical trials of DC-based cancer immunotherapy (Galluzzi et al., 2012). In AML, several DC vaccine studies have already incorporated TLR agonists [i.e., poly(I:C), OK-432, and R-848] to promote DC maturation (Table 2). 6. Choice of Target Antigen. The primary immunologic goal of DC-based cancer therapy is to immunize or vaccinate the patients by inducing a (memory) tumor antigen-specific T-cell immune response via the intrinsic antigen-presenting ability of DCs (Gilboa, 2007). As a consequence, the choice of antigenic target probably represents one of the most critical aspects in DC vaccine design (Gilboa, 2007). Since the discovery of the first cancer antigen by Boon and colleagues in 1991 (van der Bruggen et al., 1991) (Fig. 1), more than 100 tumor antigens have been identified and their number is still increasing (Cheever et al., 2009). Selecting the right target antigen has thus become a challenging task (Cheever et al., 2009; Anguille et al., 2012b). To facilitate and rationalize this antigen selection process, the Translational Research Working Group of the National Cancer Institute has proposed a number of criteria for assessing the suitability of a given tumor antigen for immunotherapeutic targeting (Cheever et al., 2009). Based on this report, preference should be given to antigens that: i) are overexpressed in the tumor cell compartment but not (or only minimally) expressed in normal cells and tissues; ii) are consistently overexpressed among patients with a given tumor type and, within each patient, expressed in most to all tumor cells; iii) play a role in the malignant phenotype; iv) contain both CD8+ and CD4+ T-cell epitopes and are immunologically relevant (i.e., demonstration of immunity toward the antigen in cancer patients); and v) hold clinical relevance (i.e., demonstration of clinical responses in immunotherapy studies targeting the given antigen) (Cheever et al., 2009; Anguille et al., 2012b). One example of a tumor-associated antigen that fulfils all these requirements and that is known to be overexpressed in AML is the Wilms’ tumor 1 (WT1) protein (Anguille et al., 2012b), which has already been shown to be an excellent choice for DC-based immunotherapy in AML (Van Tendeloo et al., 2010; Van Driessche et al., 2012). An upcoming trend is to target antigens that are preferentially expressed in the cancer stem cell compartment, to enable eradication of the malignant cell population that is responsible for tumor propagation and/or recurrence (Ruben et al., 2013; Snauwaert et al., 2013). The best source of antigenic material remains another unresolved issue in DC product design (Gilboa, 2007) (Fig. 3). Tumor antigens can be derived from either “undefined” or “defined” antigen sources (Nicolette et al., 2007). Undefined antigen preparations contain both known and unknown epitopes (Nicolette et al., 2007); examples used in the setting of DC therapy for AML are peptides eluted from the tumor cell surface, whole AML cell preparations for fusion with DCs, necrotic AML cell lysates (e.g., prepared by repeated freeze-thaw cycles), apoptotic AML cells (e.g., prepared by γ-irradiation), total tumor RNA extracted from the AML cells, and AML cell-derived extracellular vesicles (van der Pol et al., 2012) including exosomes (small vesicles of endosomal origin released from live cells) and apoptotic blebs (large vesicles released from cells undergoing apoptosis) (van den Ancker et al., 2010; Anguille et al., 2012c; Yao et al., 2014). Sources of defined antigens are synthetic peptides or nucleic acids encoding a specific tumor antigen (van den Ancker et al., 2010; Anguille et al., 2012c). Several of these undefined and defined antigen sources have already been used in moDC-based vaccine trials in AML (Table 2). The main advantage of using undefined antigen preparations is that they cover the full repertoire of antigens expressed by the tumor cells (Schui et al., 2002; Nicolette et al., 2007; Tesfatsion, 2014). At the same time, this is also considered to be their major disadvantage. Indeed, with an undefined antigenic payload, there is a high likelihood of delivering immunologically irrelevant antigens or even self-antigens, which may lead to T-cell tolerance or autoimmunity (Schottker and Schmidt-Wolf, 2011). For example, some concern has been recently raised over two tumor antigens, survivin and receptor for hyaluronic acid–mediated motility, because of their expression in activated T lymphocytes imposing a risk for T-cell fratricide (Leisegang et al., 2010; Snauwaert et al., 2012). Furthermore, using tumor cells or tumor cell elements as antigen source entails the risk of delivering other tumor-derived factors that have immunosuppressive effects (e.g., IL-10 and transforming growth factor-β) (Schui et al., 2002; Schottker and Schmidt-Wolf, 2011; Szczepanski et al., 2011; Ruben et al., 2013; Hong et al., 2014). Nevertheless, several studies have shown that an effective CTL immune response can be triggered by DCs charged with either necrotic leukemic cell lysates or apoptotic leukemic cells or blebs (Galea-Lauri et al., 2002; Spisek et al., 2002; Weigel et al., 2006; Ruben et al., 2014). One plausible explanation for this observation is that the potential immunosuppressive effects of tumor cells can be overcome by the various immunostimulatory factors released from tumor cells upon necrotic or apoptotic cell death induction (Chiang et al., 2010). For example, tumor cells undergoing necrosis have been shown to release heat-shock proteins (HSPs) and high mobility group box 1 (HMGB1), factors that are known to promote the maturation of DCs via a TLR4-dependent mechanism (Chiang et al., 2010). Apoptotic tumor cells can also release HSPs and HMGB1 and expose calreticulin on their cell surface. Calreticulin acts as an “eat me signal,” facilitating phagocytic uptake by DCs (Chiang et al., 2010; Guo et al., 2014; de Bruyn et al., 2015). Oxidation by hypochlorous acid (HOCl) treatment is a relatively novel strategy to produce highly immunogenic tumor cell preparations for DC antigen loading. In addition to inducing necrotic cell death (with the related advantage of eliciting the release of HSPs, HMGB1, and other DC-activating signals), exposure of tumor cells to HOCl gives rise to oxidized biomolecules, which can lead to direct DC activation and promote DC antigen processing and (cross-) presentation. Moreover, it has been proposed that HOCl reduces the production of immunosuppressive cytokines (e.g., IL-10) by tumor cells (Chiang et al., 2010, 2013, 2015). To the best of our knowledge, HOCl-treated leukemic cells have not yet been used as antigen source in moDC-based immunotherapy protocols in AML. The method used for delivering the antigenic payload to the DCs is another aspect that requires careful consideration, because this has a major impact on the antigen-presenting quality of the final DC therapeutic product (Gilboa, 2007) (Fig. 3). So far, most DC-based immune interventions against cancer, including AML, have relied on the use of peptide pulsing or pulsing with lysed or apoptotic tumor cells for antigen loading (Figdor et al., 2004; van den Ancker et al., 2010) (Table 2). Other antigen-loading methods, such as chemical or electrical fusion of DCs with tumor cells and the use of tumor-derived extracellular vesicles (exosomes and apoptotic blebs) as antigen-delivery carriers, are increasingly finding their way into clinical trials (Galluzzi et al., 2012; Ruben et al., 2014; Gu et al., 2015). Although full-scale comparisons of these various approaches are lacking, there are some data favoring the use of certain antigen-delivery methods over others. For example, pulsing of moDCs with apoptotic AML cells has a higher antigen-loading efficiency compared with pulsing with lysates (Galea-Lauri et al., 2002; van den Ancker et al., 2011). Fusion of DCs with AML cells also seems to be superior to loading with lysed or apoptotic leukemic cells (Galea-Lauri et al., 2002; Klammer et al., 2005), although one report found no clear difference in functionality between lysate-pulsed DCs and AML-DC fusion hybrids (Weigel et al., 2006). The use of leukemia-derived exosomes and apoptotic blebs also seems to be superior to pulsing with lysates (Gu et al., 2015) and apoptotic tumor cells (Ruben et al., 2014), respectively. A relatively new method for antigen loading of DCs involves the use of antigen-containing synthetic nano- or microparticles (Zhang et al., 2013). This strategy not only allows for delivering antigen but also for providing DCs with immunostimulatory adjuvants (Zhang et al., 2013). Zhang et al. (2013) recently showed that polymeric microparticles containing both WT1 and the TLR9 agonist CpG can be used to generate DCs with potent capacity to stimulate WT1-specific antileukemic immunity. DCs can also be genetically modified to synthesize and express predefined tumor antigen(s), e.g., by using lentiviral vectors encoding a given tumor antigen (Sundarasetty et al., 2013) or by electroporating tumor antigen-encoding mRNA into the cells (Smits et al., 2009). The latter technique has gained increasing popularity over the past decade (Gilboa and Vieweg, 2004) and has also been adopted in moDC-based vaccine trials in patients with AML (Anguille et al., 2012c) (Table 2). The attractiveness of the mRNA electroporation strategy lies in its demonstrated in vivo ability to induce a broad (i.e., multiepitope) leukemia-specific immune response without the need for taking into account the human leukocyte antigen constitution of the patient; this is in contrast with tumor antigen peptide pulsing, which is restricted to a particular human leukocyte antigen (Van Tendeloo et al., 2010). Although each loading strategy has its own specific advantages and disadvantages, perhaps the most decisive argument for selecting a particular method is whether it allows for delivering the antigen in the context of both MHC class I and II molecules (Gilboa and Vieweg, 2004). Indeed, the simultaneous presentation of MHC class I and class II epitopes to recruit both CD8+ and CD4+ T cells is considered to be a critical determinant for effective and long-lasting antitumor immunity (Wang, 2002) (Supplemental Video). When DCs are pulsed with lysates or apoptotic tumor cells, the antigens will predominantly enter the exogenous, MHC class II–processing pathway; these antigen-loading methods rely on cross-presentation to enable class I presentation (Decker et al., 2006). Although cross-presentation has been shown to occur in vivo (Kitawaki et al., 2011a), this process may not always be effective (Decker et al., 2006). One way to overcome this is to combine different antigen-loading methods (e.g., pulsing with lysates in conjunction with mRNA loading) to allow the antigen(s) to access both the MHC class I– and II–processing pathways (Decker et al., 2009; Decker et al., 2006). Another appealing strategy is to use tumor antigen-encoding mRNA that is appended with an MHC class II–targeting sequence of an endosomal/lysosomal protein, such as DC-lysosome-associated membrane protein (Benteyn et al., 2013). The advent of electroporation technology and other genetic engineering methods has now also opened up the possibility to fine-tune the phenotype and function of DCs toward the desired immunostimulatory direction (Smits et al., 2009). DCs with an enhanced immunostimulatory profile can be obtained by genetically enforcing the expression of costimulatory molecules, e.g., OX40L (Yanagita et al., 2004) or the TH1-polarizing cytokine IL-12 (Curti et al., 2005) (Fig. 2, inset). Short-interfering RNA technology has been used effectively to silence genes that have a negative impact on the immunostimulatory potency of DCs, e.g., genes coding for coinhibitory molecules, such as PD-L1/2 (Hobo et al., 2010, 2013), genes coding for suppressive cytokines, such as IL-10 (Iversen et al., 2009; Iversen and Sioud, 2015), or genes coding for signaling molecules regulating cytokine expression in DCs, such as signal transducer and activator of transcription-3 (Brady et al., 2013; Sanseverino et al., 2014) and suppressor of cytokine signaling-1 (Zhou et al., 2006) (Fig. 2, inset). The classic parenteral routes of drug administration, e.g., intravenous, are conceptually less appropriate for DC vaccine administration, because DCs administered through these routes are not primarily distributed to their main site of action, the lymph node (Malik et al., 2014). To enable delivery to the lymph node, DCs are usually administered by subcutaneous or intradermal injection nearby peripheral lymph nodes or by intralymphatic or direct intranodal injection (Pyzer et al., 2014). A meta-analysis of clinical trials of DC-based immunotherapy in prostate cancer and renal cell cancer revealed that the choice of administration route may indeed influence the therapeutic efficacy, with lymph node-targeting administration routes being superior over the intravenous route (Draube et al., 2011). Nevertheless, intravenous DC vaccination has been reported to elicit durable clinical responses in melanoma (e.g., intravenously injected TriMix DCs) (Wilgenhof et al., 2013) and to prolong overall survival in prostate cancer (e.g., sipuleucel-T) (Kantoff et al., 2010), allowing us to conclude that intravenous administration can be an effective route to deliver DC vaccines. Focusing on AML, most clinical trials of moDC-based vaccination have employed the intradermal administration route; only limited experience has been obtained with subcutaneous or intravenous DC vaccine administration in the context of AML (Table 2). One study combined intradermal and intravenous administration in an attempt to target DCs to both the lymph nodes and the bone marrow (Kitawaki et al., 2011b), which is the primary site in AML where high-avidity antileukemia T cells reside (Melenhorst et al., 2009). However, because of the small sample size of this study, it is impossible to conclude whether combined intradermal/intravenous administration is superior over intradermal administration alone from a clinical standpoint. For any DC strategy to be effective, it is imperative that the immune cells of the host are responsive to stimulation and functionally capable of mediating tumor rejection (Mellman et al., 2011). However, very often the functioning of the immune system is disturbed in cancer patients (Finn, 2012). This observation also applies to patients with AML, who frequently have a compromised immune status that prevents them from mounting protective antileukemic immune responses (Anguille et al., 2011a; Schurch et al., 2013). For instance, patients with AML often spontaneously develop leukemia-specific CTLs (Anguille et al., 2012b), but these are every so often anergic (Narita et al., 2001; Beatty et al., 2009) or dysfunctional (Le Dieu et al., 2009; Florcken et al., 2013) and thereby fail to recognize and kill their targets. Similarly, at the innate immunity level, NK cells of AML patients are often functionally disabled (Lion et al., 2012b). This impaired immune competence can dramatically hamper the efficacy of DC therapy in patients with AML. Therefore, to maximize the chance of treatment success, future DC studies for AML must not only focus on enforcing the intrinsic immunostimulatory properties of the DCs used in the therapeutic formulation, but also on harnessing the capacity of the patients’ immune cells to respond to DC stimulation and to properly perform their cytotoxic effector functions against AML cells. 1. Enhancing T-Cell–Mediated Antitumor Immunity. The adaptive immune response against cancer can be harnessed by modulating the signals that govern T-cell stimulation or inhibition at the DC/T-cell immunologic synapse (Vasaturo et al., 2013) (Fig. 2, inset). Although in some studies the focus has been on engaging costimulatory pathways to enhance T-cell function (Houtenbos et al., 2007), most research is aimed at targeting immune checkpoint pathways, such as the B7/CTLA-4 axis and the PD-1/PD-L axis (Vasaturo et al., 2013; Anguille et al., 2014; Datta et al., 2014). Combining DC therapy with CTLA-4 blockade represents an appealing strategy to potentiate DC vaccine-induced T-cell immunity (Anguille et al., 2014; Datta et al., 2014). Zhong et al. (2006) showed that the concomitant use of an mAb against CTLA-4 enhances the in vitro capacity of DCs to induce functional CTL responses against AML cells. The feasibility of using the anti–CTLA-4 mAb ipilimumab in patients with hematologic malignancies, including AML patients, was recently confirmed (Bashey et al., 2009). It is important, however, to mention that ipilimumab treatment is associated with a high percentage of immune-related adverse events (Norde et al., 2012). Furthermore, conflicting data exist regarding the effect of ipilimumab on Treg cells with some studies showing inhibition of Treg cells (Norde et al., 2012) and other studies showing Treg cell proliferation (Kavanagh et al., 2008). A similar approach revolves around the use of DCs in combination with therapeutic blockade of the PD-1/PD-L coinhibitory pathway (Norde et al., 2012). Blockade of PD-1 on T cells has been shown to promote the capacity of DCs to stimulate leukemia antigen-specific T cells (Hobo et al., 2012). The observed promotion of antileukemic immunity after interference with the PD-1/PD-L signaling pathway is not only due to enhanced activation of effector T cells but also in part due to reducing Treg cell numbers and attenuating their immunosuppressive activity (Ge et al., 2009; Zhou et al., 2010). A phase II clinical trial investigating the combined use of DC therapy with the anti–PD-1 mAb pidilizumab (CT-011; CureTech, Yavne, Israel) is currently underway in remission patients with AML (Rosenblatt et al., 2011). A clinical trial of PD-L1/2–silenced DC vaccination in combination with donor lymphocyte infusions for the treatment of post-transplant leukemia relapse has also been registered (CCMO identifier, NL37318) (Norde et al., 2012). c. B and T lymphocyte attenuator. Although CTLA-4 and PD-1 are by far the best characterized T-cell coinhibitory molecules, other negative regulators of T-cell function, such as BTLA, have been identified (Norde et al., 2012) (Fig. 2, inset). BTLA, which belongs to the same family of coinhibitory receptors as CTLA-4 and PD-1, has been implicated in the functional inhibition of tumor antigen-specific T cells (Norde et al., 2012). As demonstrated for PD-1, blockade of BTLA has been shown to enable in vitro expansion of leukemia antigen-specific T cells upon DC stimulation (Hobo et al., 2012). In contrast to CTLA-4 and PD-1, mAbs targeting BTLA have not yet entered the clinical trial arena (Hobo et al., 2012). Another attractive way to empower the antitumor effector response is to inhibit immunosuppressive cell populations, such as Treg cells and myeloid-derived suppressor cells (MDSCs) (Anguille et al., 2014). Treg cells, which occur with increased frequency in patients with AML, are well known to have suppressive effects on DCs as well as on CTLs and NK cells and thus constitute an important barrier to effective DC-based immunotherapy (Ustun et al., 2011; Anguille et al., 2014; Chiang et al., 2015; Vasaturo et al., 2015). In a murine AML model, Delluc et al. (2009) observed that Treg depletion facilitates the induction of antileukemic immunity by subsequent DC immunization, providing a strong rationale for implementing Treg-targeted therapy in DC-based immunotherapy programs (Ustun et al., 2011). Depletion or blockade of Treg cells can be achieved with a variety of pharmacological agents, including but not limited to the anti-CD25 mAb daclizumab (Zinbryta; Biogen Idec, Cambridge, MA/AbbVie, North Chicago, IL), the IL-2 immunotoxin denileukin diftitox (Ontak; Eisai Medical Research), low-dose cyclophosphamide or IDO inhibitors such as 1-methyl-tryptophan (Ustun et al., 2011; Anguille et al., 2014). Several of these agents are available for clinical use and are currently being tested in AML patients (Ustun et al., 2011). MDSCs, a heterogeneous population of immature myeloid cells with immunosuppressive properties, have recently drawn increasing attention as potential targets for improving the efficacy of DC-based cancer immunotherapies (Anguille et al., 2014; Vasaturo et al., 2015). Although the precise role and significance of these cells in AML remains largely elusive (Teague and Kline, 2013; De Veirman et al., 2014), the number of MDSCs appears to be inversely correlated with clinical outcome in DC vaccine-treated AML patients (Ogasawara and Ota, 2014), underscoring their potential importance. 2. Enhancing Natural Killer Cell–Mediated Antitumor Immunity. Although much focus is being placed on augmenting T-cell immunity, it is important not to lose sight of the important role of NK cells in antitumor immunity (Lion et al., 2012a,b). As discussed above, the efficacy of DC therapy relies in part on the presence of a competent innate immune system (Lion et al., 2012a; Van Elssen et al., 2014). In this context, NK cell activation after DC administration in AML patients has been shown to correlate with favorable clinical outcome (Van Tendeloo et al., 2010; Lion et al., 2012a). In view of this, it is likely that the efficacy of DC-based immunotherapy can be further improved by harnessing the NK-cell stimulatory potential of DCs or by combining DCs with therapies that potentiate NK-cell immunity (Anguille et al., 2011a, 2013, 2014). DCs can be endowed with the ability to stimulate NK cell cytotoxicity toward AML cells by using IL-15 instead of IL-4 during moDC differentiation and/or by using TLR ligands for inducing their maturation (Anguille et al., 2013, 2015; Okada et al., 2015). DCs genetically engineered to express NK cell–activating cytokines, such as IFN-α (Anguille et al., 2011b), can also be used to harness the antileukemic activity of NK cells (Willemen et al., 2015). Another conceptually attractive approach is to use these cytokines as adjuvants during DC therapy (Anguille et al., 2014). IL-15, which recently became available for clinical use (Conlon et al., 2015), may be of particular interest in this regard given its potent NK-cell stimulatory properties (Van den Bergh et al., 2015). In addition, IL-15 can sensitize AML cells for NK cell–mediated killing by upregulating activating NK cell receptors on the AML cell surface (Szczepanski et al., 2010). Endogenous IL-15 is induced in AML patients after lymphodepleting chemotherapy and leads to in vivo expansion of NK cells (Miller et al., 2005; Bachanova et al., 2014). This postchemotherapy surge in IL-15 provides a strong rationale for scheduling the administration of DCs in AML patients after the initial chemotherapy (Barrett and Le Blanc, 2010). Whether DC-induced antitumor immunity will lead to cancer eradication ultimately depends on the strength of the immune system to overcome the various immune escape mechanisms used by the tumor cells (Anguille et al., 2014; Vasaturo et al., 2015) (Fig. 2). AML cells also exploit a myriad of mechanisms to defend themselves against immune attack (Barrett and Le Blanc, 2010; Teague and Kline, 2013). A comprehensive review on immune escape in AML has been provided elsewhere (Lion et al., 2012b; Teague and Kline, 2013) and will therefore not be discussed in detail here. In this section, we will only mention some examples of immune escape mechanisms for which treatment solutions are readily applicable and that can be targeted to synergistically enhance the efficacy of DC-based cancer immunotherapy in AML. One well recognized mechanism by which AML cells inhibit antileukemic immune responses is through expression of ligands for PD-1 (Zhang et al., 2009; Zhou et al., 2010; Teague and Kline, 2013). As discussed in the previous section, PD-L1/2 provides an inhibitory signal to T cells during DC–T-cell interaction (Fig. 2, inset). Because PD-L1 can also be expressed on AML blasts and can be used by these cells to inhibit CTL function directly (Saudemont and Quesnel, 2004) as well as indirectly via Treg cells (Zhou et al., 2010), conjoint targeting of the PD-1/PD-L pathway can help to improve the efficacy of DC therapy on three fronts: 1) by favoring effective antigen presentation at the DC–T-cell immunologic synapse, 2) by restoring AML-induced suppression of CTL function, and 3) by counteracting Treg cells. Another example of an immunosuppressive molecule that can be expressed by both DCs and AML cells is IDO (Curti et al., 2007, 2010; Chamuleau et al., 2008; Sorensen et al., 2009; Teague and Kline, 2013) (Fig. 2). In view of its central role in Treg biology, targeting IDO has been proposed as an attractive strategy to overcome Treg-mediated immune escape in AML (Ustun et al., 2011; Teague and Kline, 2013; Arpinati and Curti, 2014). A clinical trial using the IDO inhibitor 1-methyl tryptophan in combination with DC therapy was recently initiated for patients with metastatic breast cancer (ClinicalTrials.gov identifier: NCT01042535). It should, however, be taken into account that the adaptive immune system can react against IDO-expressing tumor cells by targeting IDO (Sorensen et al., 2009). Indeed, spontaneous T-cell responses against IDO have been detected in cancer patients, and these IDO-reactive CTLs have been shown capable of killing IDO-expressing AML blasts (Sorensen et al., 2009). From a theoretical point of view, IDO inhibitors could thus have a negative impact on antileukemic immunity. Other Treg-targeting strategies may therefore be preferred. The CD200 surface molecule was recently recognized as a key mediator of immune escape in AML (Martner et al., 2013). CD200 contributes to AML-induced immunosuppression through a multifaceted mode of action, which includes active inhibition of TH1 responses (Coles et al., 2012a), induction of Treg cells (Coles et al., 2012b), and suppression of NK cell function (Coles et al., 2011). In an in vitro study of AML, Memarian et al. (2013) showed that abrogation of CD200/CD200R interaction enhances the T-cell-stimulatory capacity of DCs. These observations provide a compelling rationale for combining DC vaccination with anti-CD200 agents. Samalizumab (Alexion Pharmaceuticals, Cheshire, CT), an anti-CD200 mAb, is currently under investigation in a phase I clinical trial in patients with chronic lymphocytic leukemia and multiple myeloma (Mahadevan et al., 2010), but, to the best of our knowledge, has not yet been studied in the context of AML or in combination with DC therapy. 4. Mobilizing Acute Myeloid Leukemia Cells from Immune-Privileged Bone Marrow Niches. AML cells are also capable of hiding from immune detection, at least in part by residing in immune-privileged bone marrow niches (Barrett and Le Blanc, 2010; Peled and Tavor, 2013). One conceptually attractive strategy to increase their visibility to the immune system is to mobilize AML cells out of these protective bone marrow niches (Zeng et al., 2009; Uy et al., 2012). Antagonists for C-X-C chemokine receptor type-4 (CXCR-4) can be used for this purpose as they disrupt the interaction between CXCR-4 expressed on AML cells with stromal cell–derived factor-1α expressed on bone marrow stromal cells (Zeng et al., 2009; Uy et al., 2012; Zhang et al., 2012; Peled and Tavor, 2013). A recent phase I and II clinical study in AML patients has confirmed that plerixafor (Mozobil; Genzyme/Sanofi, Cambridge, MA), a CXCR-4 antagonist used for hematopoietic stem cell mobilization, can disengage AML cells from the bone marrow and increase their sensitivity to chemotherapy (Uy et al., 2012). Histone deacetylase inhibitors, which are increasingly being used in the treatment of AML, may have a similar effect by repressing CXCR-4 expression in AML cells (Gul et al., 2010; Mandawat et al., 2010). 5. Undoing Tumor Cells’ Cloak of Invisibility. In addition to residing in protective bone marrow niches, AML cells are notorious for creating an “invisibility cloak” that prevents them from being recognized by T cells and NK cells (Teague and Kline, 2013). Elements of this “invisibility cloak” include downregulation of leukemia antigen presentation, reduced expression of MHC and T-cell costimulatory molecules, or shedding of surface molecules involved in immune recognition and activation (e.g., NKG2D ligands) (Barrett and Le Blanc, 2010; van Luijn et al., 2010; Lion et al., 2012b; Teague and Kline, 2013). These immune evasion mechanisms can clearly affect the efficacy of active specific immunotherapy approaches such as DC therapy. Therefore, strategies for potentiating immune recognition and destruction of AML cells may be exploited in combination with DC-based immunotherapy to increase its therapeutic activity (Anguille et al., 2014). A number of pharmacological agents can be used for this purpose, including cytokines, TLR ligands, hypomethylating agents (e.g., azacitidine and decitabine), histone deacetylase inhibitors, and kinase inhibitors (for references, see Table 3). Finally, AML cells may not only evade the immune system by hiding from immune recognition but also by being present in such large numbers that the immune system is simply outweighed (Emens and Jaffee, 2005; Drake, 2010; Schlom, 2012). This provides a compelling rationale to first reduce the tumor burden with conventional chemotherapy before applying immunotherapy strategies, such as DC therapy. Support for this concept has been obtained in different tumor models (Choudhury et al., 2006; Drake, 2010; Schlom, 2012), including AML, where the administration of DCs after standard remission induction chemotherapy (i.e., in the setting of minimal residual disease) has shown encouraging results (Van Tendeloo et al., 2010). Although chemotherapy is traditionally being considered to be immunosuppressive (e.g., by tilting the balance between antitumor immune effector cells and Treg cells in favor of the latter) (Lichtenegger et al., 2014), many chemotherapeutic agents used for AML appear to have paradoxical immune-potentiating effects (Obeid et al., 2007; Liseth et al., 2010; Wemeau et al., 2010; van de Ven et al., 2012). For example, cytarabine and anthracyclines (the two standard chemotherapeutic agents in AML) cause AML cells to undergo immunogenic apoptosis (Wemeau et al., 2010; Fredly et al., 2011), thereby favoring the development of antileukemia immunity (Barrett and Le Blanc, 2010; Rezvani et al., 2012). These observations provide strong support for the concept of chemoimmunotherapy in AML. DC-based vaccination strategies are also being increasingly applied in the context of allogeneic hematopoietic stem-cell transplantation for AML to boost the graft-versus-leukemia reaction. The reader is referred to Plantinga et al. (2014) for an update on DC-based immunotherapy in the postallogeneic hematopoietic stem-cell transplantation setting. Because they lie at the heart of the immune system’s ability to recognize and eliminate cancer cells, DCs have attracted a great deal of interest for antitumor immunotherapy in recent decades (Palucka and Banchereau, 2012; Anguille et al., 2014). Current efforts in the field of DC-based cancer immunotherapy are geared toward identifying the key factors responsible for therapeutic success/failure to unleash the full clinical potential of DCs for cancer immunotherapy (Kirkwood et al., 2012; Anguille et al., 2014; Chiang et al., 2015). AML can be a good study model for this purpose, in particular because it allows us to examine the efficiency of this form of immunotherapy in a low tumor burden context (i.e., in the setting of minimal residual disease), which is probably the most appropriate clinical situation to apply immunotherapy (Gulley et al., 2011). In recent years, many efforts have been made to refine and optimize the protocols for DC manufacturing (condition no. 1), but, at the same time, we should be aware that therapeutic success is likely not to result from a single intervention. The future of DC therapy lies in combining this form of active specific immunotherapy with other therapies to increase the antitumor activity of the immune effector cells (condition no. 2) and to overcome the myriad of immune escape mechanisms used by cancer cells (condition no. 3) (Anguille et al., 2014; Chiang et al., 2015). The past decade has witnessed the advent of a new generation of DC vaccines with improved potency. This, together with the ever-expanding portfolio of immunomodulatory and immune-potentiating therapies available for combinatorial use, may allow us to conclude that we now stand on the brink of realizing the true potential of DCs for cancer immunotherapy. Wrote or contributed to the writing of the manuscript: Anguille, Smits, Bryant, Van Acker, Goossens, Lion, Fromm, Van Tendeloo, Berneman. This work was supported by grants of the Research Foundation Flanders (FWO Vlaanderen, Grant G039914N); the Methusalem program of the Flemish Government attributed to Goossens; the Belgian Foundation against Cancer (Stichting tegen Kanker); the Belgian Public Utility Foundation VOCATIO; and the Belgian Hercules Foundation. S.A. is a former PhD fellow of the Research Foundation Flanders and a former holder of an Emmanuel van der Schueren Fellowship granted by the Flemish League against Cancer (Vlaamse Liga tegen Kanker). S.A. was awarded a 2012 Endeavour Research Fellowship by the Department of Industry, Innovation, Science, Research and Tertiary Education of the Australian Government. This article has supplemental material available at pharmrev.aspetjournals.org. (2013) Targeting of 111In-labeled dendritic cell human vaccines improved by reducing number of cells. Clin Cancer Res 19:1525–1533. (2010) The DNA demethylating agent 5-aza-2′-deoxycytidine induces expression of NY-ESO-1 and other cancer/testis antigens in myeloid leukemia cells. Leuk Res 34:899–905. (2015) Poly(I:C) as cancer vaccine adjuvant: knocking on the door of medical breakthroughs. Pharmacol Ther 146:120–131. (2011a) Dendritic cell vaccine therapy for acute myeloid leukemia: questions and answers. Hum Vaccin 7:579–584. (2012a) Interleukin-15-induced CD56(+) myeloid dendritic cells combine potent tumor antigen presentation with direct tumoricidal potential. PLoS ONE 7:e51851. (2013) Interleukin-15 dendritic cells as vaccine candidates for cancer immunotherapy. Hum Vaccin Immunother 9:1956–1961. (2011b) Interferon-α in acute myeloid leukemia: an old drug revisited. Leukemia 25:739–748. (2009) Short-term cultured, interleukin-15 differentiated dendritic cells have potent immunostimulatory properties. J Transl Med 7:109. (2014) Clinical use of dendritic cells for cancer therapy. Lancet Oncol 15:e257–e267. (2015) Interleukin-15 dendritic cells harness NK cell cytotoxic effector function in a contact- and IL-15-dependent Manner. PLoS ONE 10:e0123340. (2012b) Leukemia-associated antigens and their relevance to the immunotherapy of acute myeloid leukemia. Leukemia 26:2186–2196. (2012c) Dendritic cell vaccination in acute myeloid leukemia. Cytotherapy 14:647–656. (2011) Bryostatin-1, a naturally occurring antineoplastic agent, acts as a Toll-like receptor 4 (TLR-4) ligand and induces unique cytokines and chemokines in dendritic cells. J Biol Chem 286:24–34. (2014) Immunotherapy in acute myeloid leukemia. Immunotherapy 6:95–106. (2011) Cancer-testis antigen expression and its epigenetic modulation in acute myeloid leukemia. Am J Hematol 86:918–922. (2014) Clearance of acute myeloid leukemia by haploidentical natural killer cells is improved using IL-2 diphtheria toxin fusion protein. Blood 123:3855–3863. (1955) Immunity to methylcholanthrene-induced tumours in inbred rats following atrophy and regression of the implanted tumours. Br J Cancer 9:652–657. (2012) The differential production of cytokines by human Langerhans cells and dermal CD14(+) DCs controls CTL priming. Blood 119:5742–5749. (2010) Immunotherapy prospects for acute myeloid leukaemia. Clin Exp Immunol 161:223–232. (2009) CTLA4 blockade with ipilimumab to treat relapse of malignancy after allogeneic hematopoietic cell transplantation. Blood 113:1581–1588. (2009) Functional unresponsiveness and replicative senescence of myeloid leukemia antigen-specific CD8+ T cells after allogeneic stem cell transplantation. Clin Cancer Res 15:4944–4953. (2011) Effects of TLR agonists on maturation and function of 3-day dendritic cells from AML patients in complete remission. J Transl Med 9:151. (2003) Intranodal administration of peptide-pulsed mature dendritic cell vaccines results in superior CD8+ T-cell function in melanoma patients. J Clin Oncol 21:3826–3835. (2013) Design of an optimized Wilms' tumor 1 (WT1) mRNA construct for enhanced WT1 expression and improved immunogenicity in vitro and in vivo. Mol Ther Nucleic Acids 2:e134. (2015) mRNA-based dendritic cell vaccines. Expert Rev Vaccines 14:161–176. (2014) Vaccination with WT1 mRNA-electroporated dendritic cells: report of clinical outcome in 66 cancer patients (Abstract). Blood 124:310. (2013) Naturally circulating dendritic cells to vaccinate cancer patients. OncoImmunology 2:e23431. (2013) Repositioning therapeutic cancer vaccines in the dawning era of potent immune interventions. Expert Rev Vaccines 12:1219–1234. (2008) Maturation of monocyte-derived dendritic cells with Toll-like receptor 3 and 7/8 ligands combined with prostaglandin E2 results in high interleukin-12 production and cell migration. Cancer Immunol Immunother 57:1589–1597. (2013) Down-regulation of signal transducer and activator of transcription 3 improves human acute myeloid leukemia-derived dendritic cell function. Leuk Res 37:822–828. (2005) A two-step induction of indoleamine 2,3 dioxygenase (IDO) activity during dendritic-cell maturation. Blood 106:2375–2381. (1967) Immunological aspects of malignant disease. Lancet 1:1171–1174. (2013) Dendritic cells in cancer immunotherapy clinical trials: are we making progress? Front Immunol 4:454. (2012) Targeting dendritic cells in vivo for cancer therapy. Front Immunol 3:13. (2014) Clinical efficacy of tumor antigen-pulsed DC treatment for high-grade glioma patients: evidence from a meta-analysis. PLoS ONE 9:e107173. (1992) GM-CSF and TNF-alpha cooperate in the generation of dendritic Langerhans cells. Nature 360:258–261. (2012) How many dendritic cells are required to initiate a T-cell response? Blood 120:3945–3948. (2008) High INDO (indoleamine 2,3-dioxygenase) mRNA level in blasts of acute myeloid leukemic patients predicts poor clinical outcome. Haematologica 93:1894–1898. (2009) The prioritization of cancer antigens: a national cancer institute pilot project for the acceleration of translational research. Clin Cancer Res 15:5323–5337. (2013) The antitumor effect of human cord blood-derived dendritic cells modified by the livin α gene in lung cancer cell lines. Oncol Rep 29:619–627. 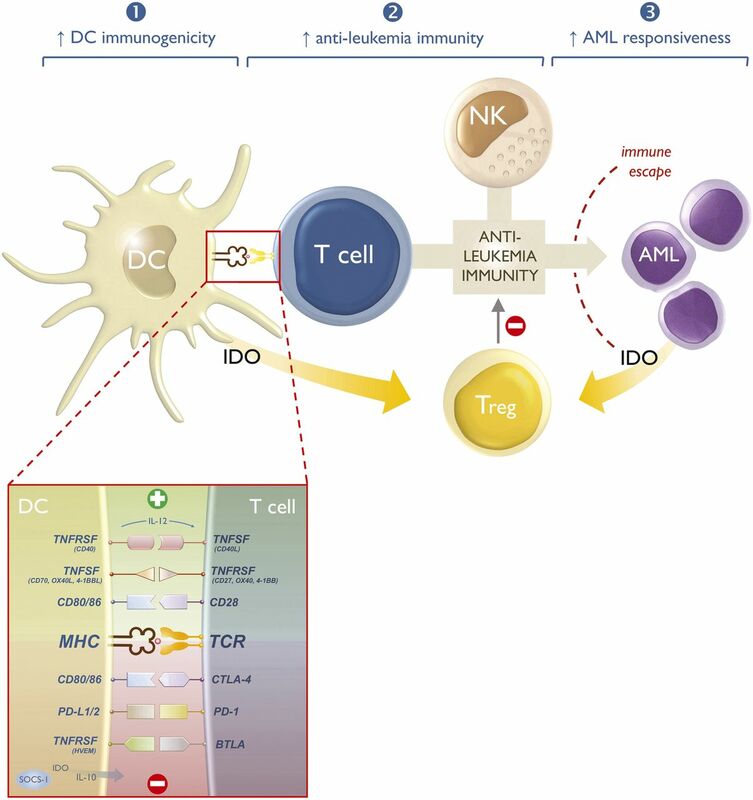 (2015) Potential approaches for more successful dendritic cell-based immunotherapy. Expert Opin Biol Ther 15:569–582. (2010) Whole tumor antigen vaccines. Semin Immunol 22:132–143. (2011) Day-4 myeloid dendritic cells pulsed with whole tumor lysate are highly immunogenic and elicit potent anti-tumor responses. PLoS ONE 6:e28732. (2013) A dendritic cell vaccine pulsed with autologous hypochlorous acid-oxidized ovarian cancer lysate primes effective broad antitumor immunity: from bench to bedside. Clin Cancer Res 19:4801–4815. (2006) Clinical results of vaccine therapy for cancer: learning from history for improving the future. Adv Cancer Res 95:147–202. (2009) Indoleamine 2,3-dioxygenase-expressing mature human monocyte-derived dendritic cells expand potent autologous regulatory T cells. Blood 114:555–563. (2009) Real-time quantitative polymerase chain reaction detection of minimal residual disease by standardized WT1 assay to enhance risk stratification in acute myeloid leukemia: a European LeukemiaNet study. J Clin Oncol 27:5195–5201. (2013) Antigen delivery to early endosomes eliminates the superiority of human blood BDCA3+ dendritic cells at cross presentation. J Exp Med 210:1049–1063. (2014) Dendritic cell-targeted vaccines. Front Immunol 5:255. (2012a) Expression of CD200 on AML blasts directly suppresses memory T-cell function. Leukemia 26:2148–2151. (2012b) Increased CD200 expression in acute myeloid leukemia is linked with an increased frequency of FoxP3+ regulatory T cells. Leukemia 26:2146–2148. (2011) CD200 expression suppresses natural killer cell function and directly inhibits patient anti-tumor response in acute myeloid leukemia. Leukemia 25:792–799. (1891) Contribution to the knowledge of sarcoma. Ann Surg 14:199–220. (2013) Human dendritic cell subsets. Immunology 140:22–30. (2015) Redistribution, hyperproliferation, activation of natural killer cells and CD8 T cells, and cytokine production during first-in-human clinical trial of recombinant human interleukin-15 in patients with cancer. J Clin Oncol 33:74–82. (2014) Tumour antigens recognized by T lymphocytes: at the core of cancer immunotherapy. Nat Rev Cancer 14:135–146. (2013) Breakthrough of the year 2013. Cancer immunotherapy. Science 342:1432–1433. (2005) Interleukin-12 production by leukemia-derived dendritic cells counteracts the inhibitory effect of leukemic microenvironment on T cells. Exp Hematol 33:1521–1530. (2007) Modulation of tryptophan catabolism by human leukemic cells results in the conversion of CD25- into CD25+ T regulatory cells. Blood 109:2871–2877. (2010) Indoleamine 2,3-dioxygenase-expressing leukemic dendritic cells impair a leukemia-specific immune response by inducing potent T regulatory cells. Haematologica 95:2022–2030. (2010) Inflammatory cytokines as a third signal for T cell activation. Curr Opin Immunol 22:333–340. (1997) Calcium ionophore-treated peripheral blood monocytes and dendritic cells rapidly display characteristics of activated dendritic cells. J Immunol 159:3823–3837. (2001) Diverse functional activity of CD83+ monocyte-derived dendritic cells and the implications for cancer vaccines. Crit Rev Immunol 21:157–178. (2014) An efficient protocol for the generation of monocyte derived dendritic cells using serum-free media for clinical applications in post remission AML patients. Ann Clin Lab Sci 44:180–188. (2014) Optimizing dendritic cell-based approaches for cancer immunotherapy. Yale J Biol Med 87:491–518. (2003) Mature dendritic cells derived from human monocytes within 48 hours: a novel strategy for dendritic cell differentiation from blood precursors. J Immunol 170:4069–4076. (2015) The ever-expanding immunomodulatory role of calreticulin in cancer immunity. Front Oncol 5:35. (2014) Myeloid-derived suppressor cells as therapeutic target in hematological malignancies. Front Oncol 4:349. (2003) Effective migration of antigen-pulsed dendritic cells to lymph nodes in melanoma patients is determined by their maturation state. Cancer Res 63:12–17. (2005) Magnetic resonance tracking of dendritic cells in melanoma patients for monitoring of cellular therapy. Nat Biotechnol 23:1407–1413. (2009) Th-1 polarization is regulated by dendritic-cell comparison of MHC class I and class II antigens. Blood 113:4213–4223. (2006) Double loading of dendritic cell MHC class I and MHC class II with an AML antigen repertoire enhances correlates of T-cell immunity in vitro via amplification of T-cell help. Vaccine 24:3203–3216. (2009) Dramatic efficacy improvement of a DC-based vaccine against AML by CD25 T cell depletion allowing the induction of a long-lasting T cell response. Cancer Immunol Immunother 58:1669–1677. (2008) NKG2D ligand expression in AML increases in response to HDAC inhibitor valproic acid and contributes to allorecognition by NK-cell lines with single KIR-HLA class I specificities. Blood 111:1428–1436. (2009) Immune responses in AML patients following vaccination with GRNVAC1, autologous RNA transfected dendritic cells expressing telomerase catalytic subunit hTERT (Abstract). Blood 114:262. (2004) Bryostatin-1 enhances the maturation and antigen-presenting ability of murine and human dendritic cells. Cancer Res 64:6756–6765. (2010) Prostate cancer as a model for tumour immunotherapy. Nat Rev Immunol 10:580–593. (2011) Dendritic cell based tumor vaccination in prostate and renal cell cancer: a systematic review and meta-analysis. PLoS ONE 6:e18801. (2007) IL-15-induced human DC efficiently prime melanoma-specific naive CD8+ T cells to differentiate into CTL. Eur J Immunol 37:1678–1690. (2014) Towards efficient cancer immunotherapy: advances in developing artificial antigen-presenting cells. Trends Biotechnol 32:456–465. (1909) Über den jetzigen Stand der Karzinomforschung. Ned Tijdschr Geneeskd 5:273–290. (2005) Leveraging the activity of tumor vaccines with cytotoxic chemotherapy. Cancer Res 65:8059–8064. (2004) Dendritic cell immunotherapy: mapping the way. Nat Med 10:475–480. (2012) Immuno-oncology: understanding the function and dysfunction of the immune system in cancer. Ann Oncol 23 (Suppl 8):viii6–9. (2013) Anti-leukemia T cells in AML: TNF-α⁺ CD8⁺ T cells may escape detection and possibly reflect a stage of functional impairment. Hum Vaccin Immunother 9:1200–1204. (1953) Antigenic properties of methylcholanthrene-induced tumors in mice of the strain of origin. Cancer Res 13:835–837. (2001) Dendritic cells injected via different routes induce immunity in cancer patients. J Immunol 166:4254–4259. (2012) Third generation dendritic cell vaccines for tumor immunotherapy. Eur J Cell Biol 91:53–58. (2011) Immunogenic apoptosis in human acute myeloid leukemia (AML): primary human AML cells expose calreticulin and release heat shock protein (HSP) 70 and HSP90 during apoptosis. Oncol Rep 25:1549–1556. (2011) Impact of the hypomethylating agent 5-azacytidine on dendritic cells function. Exp Hematol 39:1056–1063. (2002) Eliciting cytotoxic T lymphocytes against acute myeloid leukemia-derived antigens: evaluation of dendritic cell-leukemia cell hybrids and other antigen-loading strategies for dendritic cell-based vaccination. Cancer Immunol Immunother 51:299–310. (2014) Novel immune checkpoint blocker approved for the treatment of advanced melanoma. OncoImmunology 3:e967147. (2012) Trial watch: Dendritic cell-based interventions for cancer therapy. OncoImmunology 1:1111–1134. (2014) 5-Azacytidine treatment sensitizes tumor cells to T-cell mediated cytotoxicity and modulates NK cells in patients with myeloid malignancies. Blood Cancer J 4:e197. (2009) B7-H1 up-regulation on dendritic-like leukemia cells suppresses T cell immune function through modulation of IL-10/IL-12 production and generation of Treg cells. Leuk Res 33:948–957. (2004) Cancer immunotherapy with mRNA-transfected dendritic cells. Immunol Rev 199:251–263. (2010) Induction of a CD8+ T-cell response to the MAGE cancer testis antigen by combined treatment with azacitidine and sodium valproate in patients with acute myeloid leukemia and myelodysplasia. Blood 116:1908–1918. (2012) Azacitidine augments expansion of regulatory T cells after allogeneic stem cell transplantation in patients with acute myeloid leukemia (AML). Blood 119:3361–3369. (2013) The role of B7 family molecules in hematologic malignancy. Blood 121:734–744. (1943) Intradermal immunization of C3H mice against a sarcoma that originated in an animal of the same line. Cancer Res 3:326–333. (2015) Improved vaccine efficacy of tumor exosome compared to tumor lysate loaded dendritic cells in mice. Int J Cancer 136:E74–E84. (2010) Valproic acid exerts differential effects on CXCR4 expression in leukemic cells. Leuk Res 34:235–242. (2011) Impact of tumour volume on the potential efficacy of therapeutic vaccines. Curr Oncol 18:e150–e157. (2014) Oncolytic immunotherapy: dying the right way is a key to eliciting potent antitumor immunity. Front Oncol 4:74. (2013) Comparison of clinical grade type 1 polarized and standard matured dendritic cells for cancer immunotherapy. Vaccine 31:639–646. (2010) siRNA silencing of PD-L1 and PD-L2 on dendritic cells augments expansion and function of minor histocompatibility antigen-specific CD8+ T cells. Blood 116:4501–4511. (2012) B and T lymphocyte attenuator mediates inhibition of tumor-reactive CD8+ T cells in patients after allogeneic stem cell transplantation. J Immunol 189:39–49. (2013) Improving dendritic cell vaccine immunogenicity by silencing PD-1 ligands using siRNA-lipid nanoparticles combined with antigen mRNA electroporation. Cancer Immunol Immunother 62:285–297. (2010) Improved survival with ipilimumab in patients with metastatic melanoma. N Engl J Med 363:711–723. (2014) Isolation and characterization of CD34+ blast-derived exosomes in acute myeloid leukemia. PLoS ONE 9:e103310. (2013) Minimal residual disease in acute myeloid leukaemia. Nat Rev Clin Oncol 10:460–471. (2007) Leukemia-specific T-cell reactivity induced by leukemic dendritic cells is augmented by 4-1BB targeting. Clin Cancer Res 13:307–315. (2014) Ex vivo generation of interstitial and Langerhans cell-like dendritic cell subset-based vaccines for hematological malignancies. J Immunother 37:267–277. (2005) Revisiting immunosurveillance and immunostimulation: Implications for cancer immunotherapy. J Transl Med 3:8. (2009) Dendritic cells loaded with tumor antigens and a dual immunostimulatory and anti-interleukin 10-specific small interference RNA prime T lymphocytes against leukemic cells. Transl Oncol 2:242–246. (2015) Engineering therapeutic cancer vaccines that activate antitumor immunity. Methods Mol Biol 1218:263–268. (2010) Human CD141+ (BDCA-3)+ dendritic cells (DCs) represent a unique myeloid DC subset that cross-presents necrotic cell antigens. J Exp Med 207:1247–1260. (1997) Pro-inflammatory cytokines and prostaglandins induce maturation of potent immunostimulatory dendritic cells under fetal calf serum-free conditions. Eur J Immunol 27:3135–3142. (2007) Adoptive T cell therapy for cancer in the clinic. J Clin Invest 117:1466–1476. (2010) Polarized dendritic cells as cancer vaccines: directing effector-type T cells to tumors. Semin Immunol 22:173–182. (2001) Prostaglandin E(2) is a selective inducer of interleukin-12 p40 (IL-12p40) production and an inhibitor of bioactive IL-12p70 heterodimer. Blood 97:3466–3469. (2010) Sipuleucel-T immunotherapy for castration-resistant prostate cancer. N Engl J Med 363:411–422. (2008) CTLA4 blockade expands FoxP3+ regulatory and activated effector CD4+ T cells in a dose-dependent fashion. Blood 112:1175–1183. (2013) Gene-engineered T cells for cancer therapy. Nat Rev Cancer 13:525–541. (2010) Prolonged administration of the telomerase vaccine GRNVAC1 is well tolerated and appears to be associated with favorable outcomes in high-risk acute myeloid leukemia (AML) (Abstract). Blood 116:904. (1975) “Natural” killer cells in the mouse. I. Cytotoxic cells with specificity for mouse Moloney leukemia cells. Specificity and distribution according to genotype. Eur J Immunol 5:112–117. (2012) Immunotherapy of cancer in 2012. CA Cancer J Clin 62:309–335. (2011a) Cross-priming of CD8(+) T cells in vivo by dendritic cells pulsed with autologous apoptotic leukemic cells in immunotherapy for elderly patients with acute myeloid leukemia. Exp Hematol 39:424–433. (2011b) A phase I/IIa clinical trial of immunotherapy for elderly patients with acute myeloid leukaemia using dendritic cells co-pulsed with WT1 peptide and zoledronate. Br J Haematol 153:796–799. (2005) Fusion hybrids of dendritic cells and autologous myeloid blasts as a potential cellular vaccine for acute myeloid leukaemia. Br J Haematol 129:340–349. (1960) Demonstration of resistance against methylcholanthrene-induced sarcomas in the primary autochthonous host. Cancer Res 20:1561–1572. (2014) Comparison of media and serum supplementation for generation of monophosphoryl lipid A/interferon-γ-matured type I dendritic cells for immunotherapy. Cytotherapy 16:826–834. (2012) Reactivation of silenced WT1 transgene by hypomethylating agents - implications for in vitro modeling of chemoimmunotherapy. Immune Netw 12:58–65. (1997) Generation of dendritic cells from bone marrow progenitors using GM-CSF, TNF-alpha, and additional cytokines: antagonistic effects of IL-4 and IFN-gamma and selective involvement of TNF-alpha receptor-1. Immunology 91:553–559. (2009) Peripheral blood T cells in acute myeloid leukemia (AML) patients at diagnosis have abnormal phenotype and genotype and form defective immune synapses with AML blasts. Blood 114:3909–3916. (2004) Immunotherapy using autologous monocyte-derived dendritic cells pulsed with leukemic cell lysates for acute myeloid leukemia relapse after autologous peripheral blood stem cell transplantation. J Clin Apher 19:66–70. (2010) MHC-restricted fratricide of human lymphocytes expressing survivin-specific transgenic T cell receptors. J Clin Invest 120:3869–3877. (2011) Route of administration modulates the induction of dendritic cell vaccine-induced antigen-specific T cells in advanced melanoma patients. Clin Cancer Res 17:5725–5735. (2014) Impaired NK cells and increased T regulatory cell numbers during cytotoxic maintenance therapy in AML. Leuk Res 38:964–969. (2012) CD86 and IL-12p70 are key players for T helper 1 polarization and natural killer cell activation by Toll-like receptor-induced dendritic cells. PLoS ONE 7:e44266. (2011) Poly(I:C) enhances the susceptibility of leukemic cells to NK cell cytotoxicity and phagocytosis by DC. PLoS ONE 6:e20952. (2012a) NK cells: key to success of DC-based cancer vaccines? Oncologist 17:1256–1270. (2012b) Natural killer cell immune escape in acute myeloid leukemia. Leukemia 26:2019–2026. (2010) Combination of intensive chemotherapy and anticancer vaccines in the treatment of human malignancies: the hematological experience. J Biomed Biotechnol 2010:692097. (2013) Harnessing the power of the immune system to target cancer. Annu Rev Med 64:71–90. (2003) Single step enrichment of blood dendritic cells by positive immunoselection. J Immunol Methods 274:47–61. (2002) Characterization of human blood dendritic cell subsets. Blood 100:4512–4520. (2012) Clinical development of advanced therapy medicinal products in Europe: evidence that regulators must be proactive. Mol Ther 20:479–482. (2000) Up-regulation of costimulatory/adhesion molecules by histone deacetylase inhibitors in acute myeloid leukemia cells. Blood 96:3847–3856. (2010) First-in-human phase I dose escalation study of a humanized anti-CD200 antibody (Samalizumab) in patients with advanced stage B cell chronic lymphocytic leukemia (B-CLL) or multiple myeloma (MM) (Abstract). Blood 116:1024. (2002) Immature, but not inactive: the tolerogenic function of immature dendritic cells. Immunol Cell Biol 80:477–483. (2014) Are the anatomical sites for vaccine administration selected judiciously? Int Immunopharmacol 19:17–26. (2010) Pan-histone deacetylase inhibitor panobinostat depletes CXCR4 levels and signaling and exerts synergistic antimyeloid activity in combination with CXCR4 antagonists. Blood 116:5306–5315. (2014) Recognition of tumors by the innate immune system and natural killer cells. Adv Immunol 122:91–128. (2013) Immunotherapeutic strategies for relapse control in acute myeloid leukemia. Blood Rev 27:209–216. (2009) High avidity myeloid leukemia-associated antigen-specific CD8+ T cells preferentially reside in the bone marrow. Blood 113:2238–2244. (2014) Therapeutic vaccines for cancer: an overview of clinical trials. Nat Rev Clin Oncol 11:509–524. (2013) Dendritic cells: master regulators of the immune response. Cancer Immunol Res 1:145–149. (2011) Cancer immunotherapy comes of age. Nature 480:480–489. (2013) Upregulation of CD200 is associated with Foxp3+ regulatory T cell expansion and disease progression in acute myeloid leukemia. Tumour Biol 34:531–542. (2013) The dendritic cell lineage: ontogeny and function of dendritic cells and their subsets in the steady state and the inflamed setting. Annu Rev Immunol 31:563–604. (2005) Successful adoptive transfer and in vivo expansion of human haploidentical NK cells in patients with cancer. Blood 105:3051–3057. (2015) Dendritic cell-based vaccine research against cancer. Expert Rev Clin Immunol 11:213–232. (2001) Interleukin 15 skews monocyte differentiation into dendritic cells with features of Langerhans cells. J Exp Med 194:1013–1020. (2004) Histone deacetylase inhibition improves dendritic cell differentiation of leukemic blasts with AML1-containing fusion proteins. J Leukoc Biol 76:623–633. (2004) Development of a clinical grade procedure for generation of mRNA transfected dendritic cells from purified frozen CD34(+) blood progenitor cells. Int J Immunopathol Pharmacol 17:255–263. (2003) Route of immunization with peptide-pulsed dendritic cells controls the distribution of memory and effector T cells in lymphoid tissues and determines the pattern of regional tumor control. J Exp Med 198:1023–1034. (2006) Balancing co-stimulation and inhibition with BTLA and HVEM. Nat Rev Immunol 6:671–681. (2010) PGE(2) transiently enhances DC expression of CCR7 but inhibits the ability of DCs to produce CCL19 and attract naive T cells. Blood 116:1454–1459. (2001) Leukemia blast-induced T-cell anergy demonstrated by leukemia-derived dendritic cells in acute myelogenous leukemia. Exp Hematol 29:709–719. (2007) Dendritic cells for active immunotherapy: optimizing design and manufacture in order to develop commercially and clinically viable products. Vaccine 25 (Suppl 2):B47–B60. (2013) Antigen cross-presentation by dendritic cell subsets: one general or all sergeants? Trends Immunol 34:361–370. (2012) Coinhibitory molecules in hematologic malignancies: targets for therapeutic intervention. Blood 120:728–736. (2007) Calreticulin exposure dictates the immunogenicity of cancer cell death. Nat Med 13:54–61. (2014) Dendritic cell vaccination in acute leukemia patients induces reduction of myeloid-derived suppressor cells: immunological analysis of a pilot study (Abstract). Blood 124:1113. (2011) Induction of CD8+ T-cell responses against novel glioma-associated antigen peptides and clinical activity by vaccinations with alpha-type 1 polarized dendritic cells and polyinosinic-polycytidylic acid stabilized by lysine and carboxymethylcellulose in patients with recurrent malignant glioma. J Clin Oncol 29:330–336. (2015) STAT3 signaling contributes to the high effector activities of interleukin-15-derived dendritic cells. Immunol Cell Biol 93:461–471. (2014) Vaccination of acute leukemia patients with WT1 peptide-pulsed dendritic cells induces immunological and clinical responses: a pilot study (Abstract). Blood 124:2319. (2012) Cancer immunotherapy via dendritic cells. Nat Rev Cancer 12:265–277. (2010) Designing vaccines based on biology of human dendritic cell subsets. Immunity 33:464–478. (2008) IFN-alpha skews monocytes into CD56+-expressing dendritic cells with potent functional activities in vitro and in vivo. J Immunol 180:1462–1470. (2012) The blockade of immune checkpoints in cancer immunotherapy. Nat Rev Cancer 12:252–264. (2011) Treating cancer with genetically engineered T cells. Trends Biotechnol 29:550–557. (2013) Role of CXCR4 in the pathogenesis of acute myeloid leukemia. Theranostics 3:34–39. (2014) Dendritic cell therapy in an allogeneic-hematopoietic cell transplantation setting: an effective strategy toward better disease control? Front Immunol 5:218. (2009) Effective in vivo induction of NKG2D ligands in acute myeloid leukaemias by all-trans-retinoic acid or sodium valproate. Leukemia 23:641–648. (1957) Immunity to methylcholanthrene-induced sarcomas. J Natl Cancer Inst 18:769–778. (2015) A phase I clinical trial of CD1c (BDCA-1)+ dendritic cells pulsed with HLA-A*0201 peptides for immunotherapy of metastatic hormone refractory prostate cancer. J Immunother 38:71–76. (2014) Clinical trials of dendritic cell-based cancer vaccines in hematologic malignancies. Hum Vaccin Immunother 10:3125–3131. (2005) Immunoselection of functional CMRF-56+ blood dendritic cells from multiple myeloma patients for immunotherapy. J Immunother 28:322–331. (2008) Histone deacetylase inhibition modulates indoleamine 2,3-dioxygenase-dependent DC functions and regulates experimental graft-versus-host disease in mice. J Clin Invest 118:2562–2573. (2007) Challenges and prospects of immunotherapy as cancer treatment. Biochim Biophys Acta 1776:108–123. (2012) Adoptive immunotherapy for cancer: harnessing the T cell response. Nat Rev Immunol 12:269–281. (2012) Lymphodepletion is permissive to the development of spontaneous T-cell responses to the self-antigen PR1 early after allogeneic stem cell transplantation and in patients with acute myeloid leukemia undergoing WT1 peptide vaccination following chemotherapy. Cancer Immunol Immunother 61:1125–1136. (2015) Role of type I interferon in inducing a protective immune response: perspectives for clinical applications. Cytokine Growth Factor Rev 26:195–201. (2002) Primary acute myeloid leukaemia blasts resistant to cytokine-induced differentiation to dendritic-like leukaemia cells can be forced to differentiate by the addition of bryostatin-1. Leukemia 16:84–93. (2007) Differentiation-promoting drugs up-regulate NKG2D ligand expression and enhance the susceptibility of acute myeloid leukemia cells to natural killer cell-mediated lysis. Leuk Res 31:1393–1402. (2012) Human Langerhans cells use an IL-15R-α/IL-15/pSTAT5-dependent mechanism to break T-cell tolerance against the self-differentiation tumor antigen WT1. Blood 119:5182–5190. (2011) Peptide-loaded Langerhans cells, despite increased IL15 secretion and T-cell activation in vitro, elicit antitumor T-cell responses comparable to peptide-loaded monocyte-derived dendritic cells in vivo. Clin Cancer Res 17:1984–1997. (2013) CD56 marks human dendritic cell subsets with cytotoxic potential. OncoImmunology 2:e23037. (2011) Clinical trial evaluating DC/AML fusion cell vaccination alone and in conjunction with PD-1 blockade in AML patients who achieve a chemotherapy-induced remission. Blood 118:432–433. (2014) Clinical trial evaluating DC/AML fusion cell vaccination in AML patients who achieve a chemotherapy-induced remission (Abstract). Biol Blood Marrow Transplant 20:S50. (2014) Apoptotic blebs from leukemic cells as a preferred source of tumor-associated antigen for dendritic cell-based vaccines. Cancer Immunol Immunother 63:335–345. (2013) Targeting the acute myeloid leukemic stem cell compartment by enhancing tumor cell-based vaccines. Immunotherapy 5:859–868. (1995) Dendritic cells use macropinocytosis and the mannose receptor to concentrate macromolecules in the major histocompatibility complex class II compartment: downregulation by cytokines and bacterial products. J Exp Med 182:389–400. (1998) Rapid and coordinated switch in chemokine receptor expression during dendritic cell maturation. Eur J Immunol 28:2760–2769. (2014) STAT3-silenced human dendritic cells have an enhanced ability to prime IFNγ production by both αβ and γδ T lymphocytes. Immunobiology 219:503–511. (2004) In a model of tumor dormancy, long-term persistent leukemic cells have increased B7-H1 and B7.1 expression and resist CTL-mediated lysis. Blood 104:2124–2133. (2002) Prostaglandin E2 is a key factor for CCR7 surface expression and migration of monocyte-derived dendritic cells. Blood 100:1354–1361. (2012) Therapeutic cancer vaccines: current status and moving forward. J Natl Cancer Inst 104:599–613. (2014) Next-generation dendritic cells for immunotherapy of acute myeloid leukemia. J Immunother Cancer 2 (Suppl 3):84. (2013) Azacytidine impairs NK cell activity in AML and MDS patients undergoing MRD-based pre-emptive treatment after allogeneic stem cell transplantation. Blood Cancer J 3:e136. (2011) Pulsing with blast cell lysate or blast-derived total RNA reverses the dendritic cell-mediated cytotoxic activity of cytokine-induced killer cells against allogeneic acute myelogenous leukemia cells. Ger Med Sci 9:Doc18. Schreibelt G, Westdorp H, Bol KF, Winkels G, Petry K, Gerritsen WR, Figdor CG, and de Vries IJM (2014) Natural human BDCA1+ myeloid dendritic cells induce immunological and clinical anti-tumor responses in metastatic melanoma patients; 12th CIMT Annual Meeting; 2014 May 6–8;Mainz, Germany. (2002) Inhibiting effects on the induction of cytotoxic T lymphocytes by dendritic cells pulsed with lysates from acute myeloid leukemia blasts. Leuk Res 26:383–389. (2013) Dendritic cell-based immunotherapy for myeloid leukemias. Front Immunol 4:496. (2013) Similar antigen cross-presentation capacity and phagocytic functions in all freshly isolated human lymphoid organ-resident dendritic cells. J Exp Med 210:1035–1047. (2009) Dendritic cell-based cancer gene therapy. Hum Gene Ther 20:1106–1118. (2010) The Toll-like receptor 7/8 agonist resiquimod greatly increases the immunostimulatory capacity of human acute myeloid leukemia cells. Cancer Immunol Immunother 59:35–46. (2008) The use of TLR7 and TLR8 ligands for the enhancement of cancer immunotherapy. Oncologist 13:859–875. (2007) Proinflammatory response of human leukemic cells to dsRNA transfection linked to activation of dendritic cells. Leukemia 21:1691–1699. (2013) Can immunotherapy specifically target acute myeloid leukemic stem cells? OncoImmunology 2:e22943. (2012) RHAMM/HMMR (CD168) is not an ideal target antigen for immunotherapy of acute myeloid leukemia. Haematologica 97:1539–1547. (2009) The immune system strikes back: cellular immune responses against indoleamine 2,3-dioxygenase. PLoS ONE 4:e6910. (2002) Induction of leukemia-specific cytotoxic response by cross-presentation of late-apoptotic leukemic blasts by autologous dendritic cells of nonleukemic origin. Cancer Res 62:2861–2868. (2007) Dendritic cells: understanding immunogenicity. Eur J Immunol 37 (Suppl 1):S53–S60. (1973) Identification of a novel cell type in peripheral lymphoid organs of mice. I. Morphology, quantitation, tissue distribution. J Exp Med 137:1142–1162. (2014) New generation dendritic cell vaccine for immunotherapy of acute myeloid leukemia. Cancer Immunol Immunother 63:1093–1103. (2013) Lentivirus-induced dendritic cells for immunization against high-risk WT1(+) acute myeloid leukemia. Hum Gene Ther 24:220–237. (2010) Interleukin-15 enhances natural killer cell cytotoxicity in patients with acute myeloid leukemia by upregulating the activating NK cell receptors. Cancer Immunol Immunother 59:73–79. (2011) Blast-derived microvesicles in sera from patients with acute myeloid leukemia suppress natural killer cell function via membrane-associated transforming growth factor-beta1. Haematologica 96:1302–1309. (2007) Dendritic-cell immunotherapy: from ex vivo loading to in vivo targeting. Nat Rev Immunol 7:790–802. (2013) Oxidative stress induces monocyte necrosis with enrichment of cell-bound albumin and overexpression of endoplasmic reticulum and mitochondrial chaperones. PLoS ONE 8:e59610. (2013) Immune evasion in acute myeloid leukemia: current concepts and future directions. J Immunother Cancer 1:13. (2013a) Natural human plasmacytoid dendritic cells induce antigen-specific T-cell responses in melanoma patients. Cancer Res 73:1063–1075. (2014) Tumoricidal activity of human dendritic cells. Trends Immunol 35:38–46.